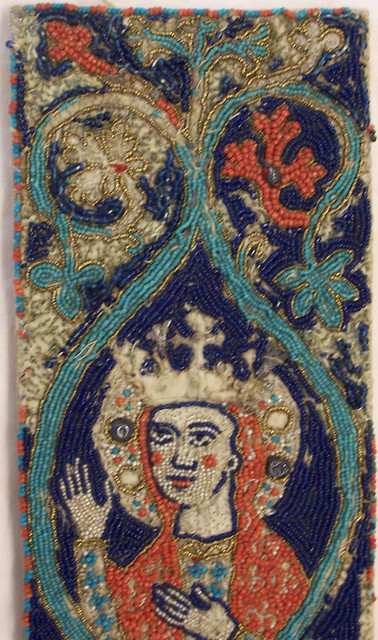 Bezants, beaded tassle tops and beads around the little glass (?) 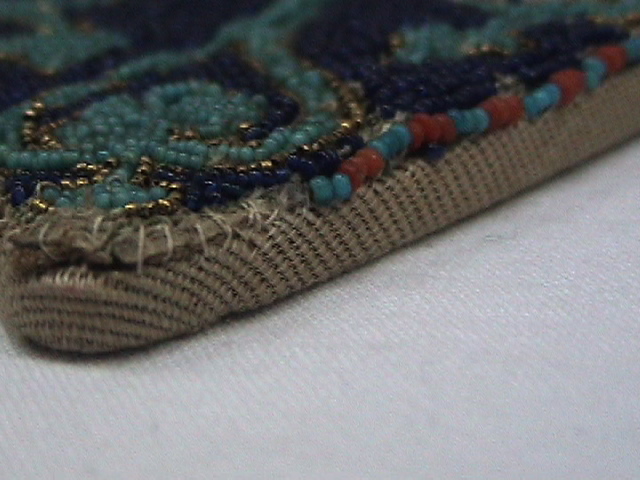 insets. 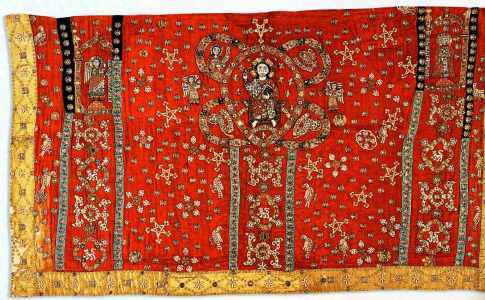 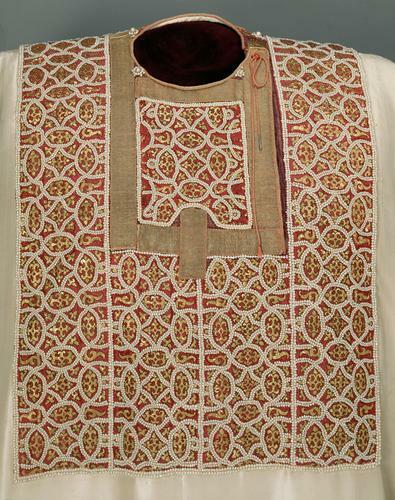 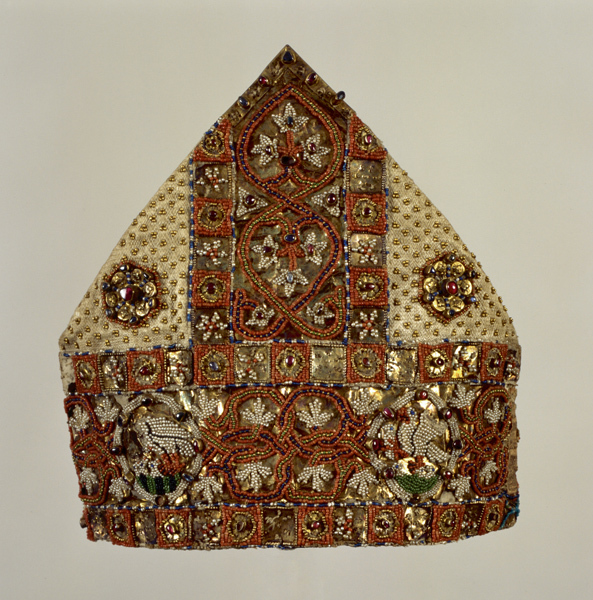 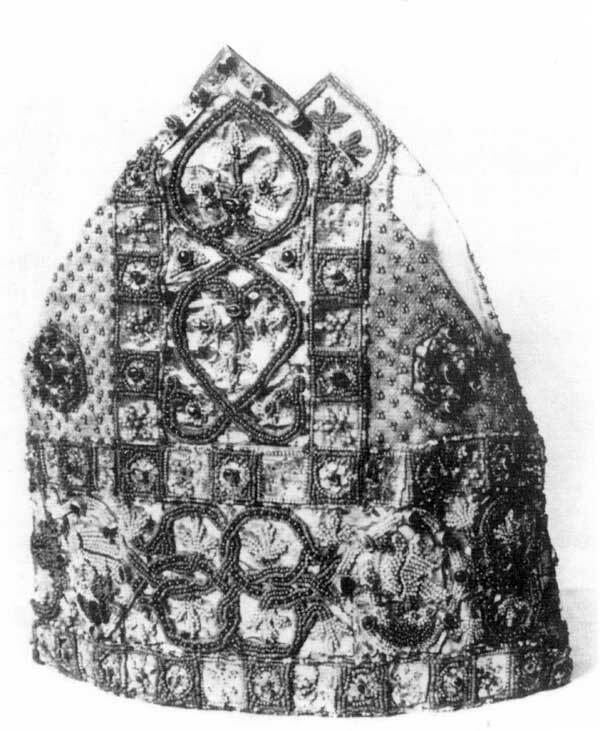 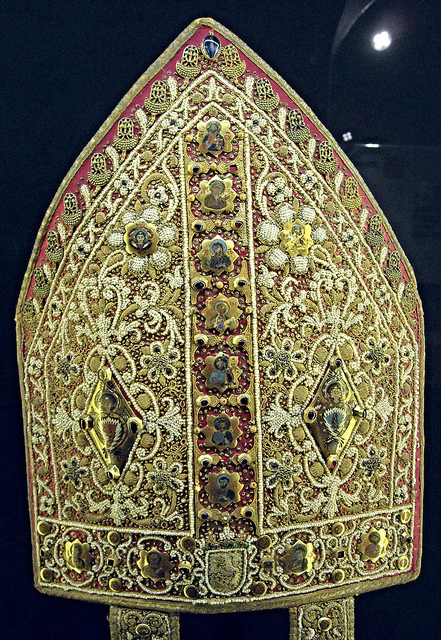 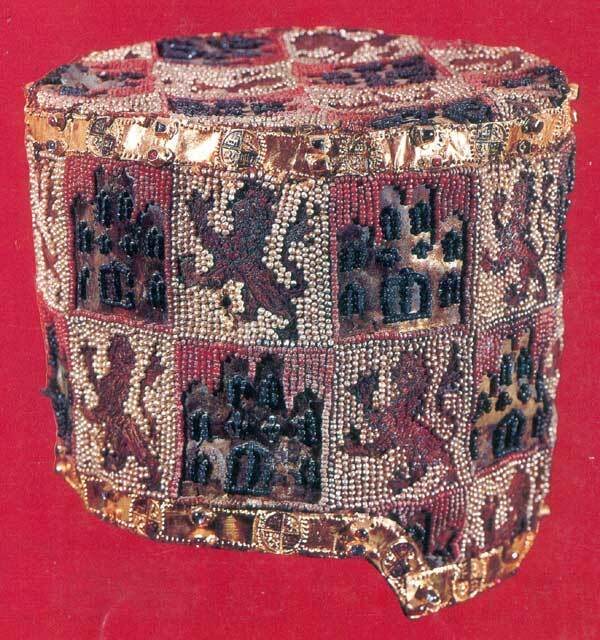 The bishop’s headdress from the Halberstadt cathedral treasure embroidered on the most sumptuous of pearls impressively demonstrates the magnificence of the medieval church service as well as the great craftsmanship of contemporary textile art. 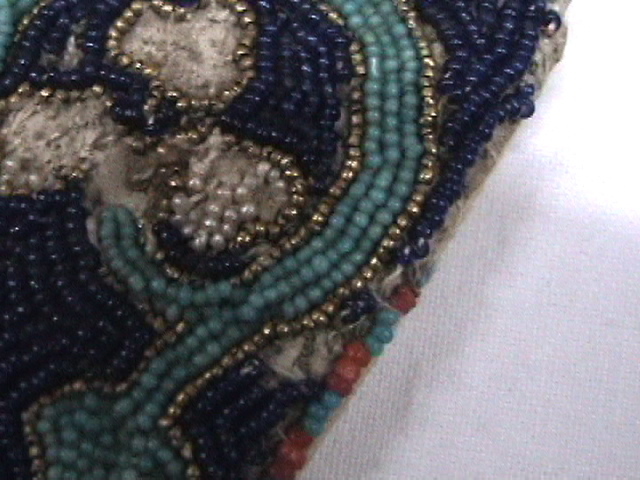 The Mitra is almost completely preserved except for two formerly hanging on the back, wide bands and looks amazingly fresh in the color of the jewelry elements. 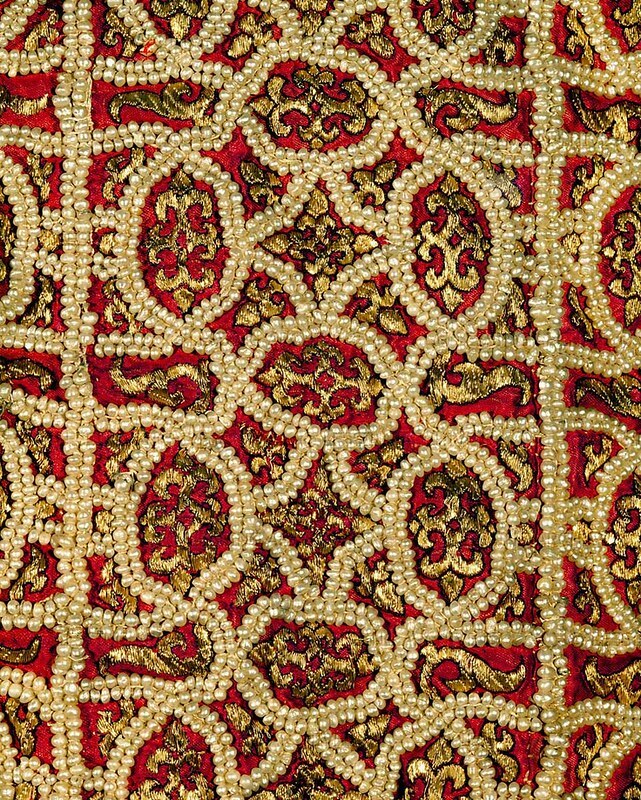 In addition to gilded jewelery sheets and colored stones in golden versions, the variety of small pearls made of red coral, colorful glass flows and gilded metal and combined with river pearls is particularly impressive. For a long time it was thought that these pearls were imported. 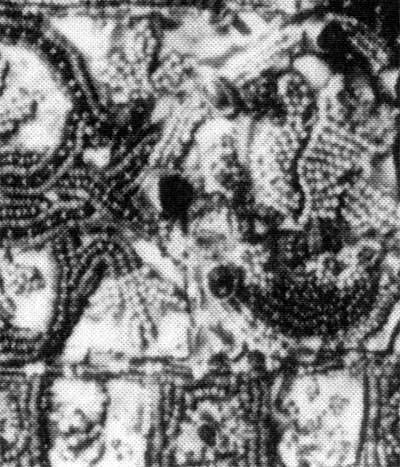 However, there is evidence that freshwater pearl mussels were more abundant in native waters before being almost completely eradicated by depletion in the 18th century. 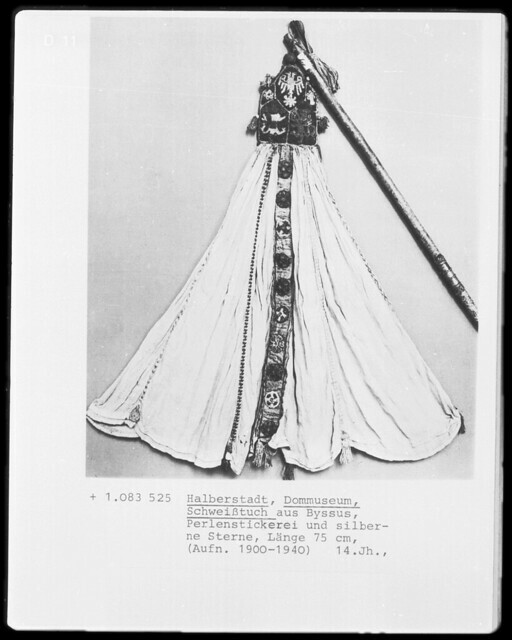 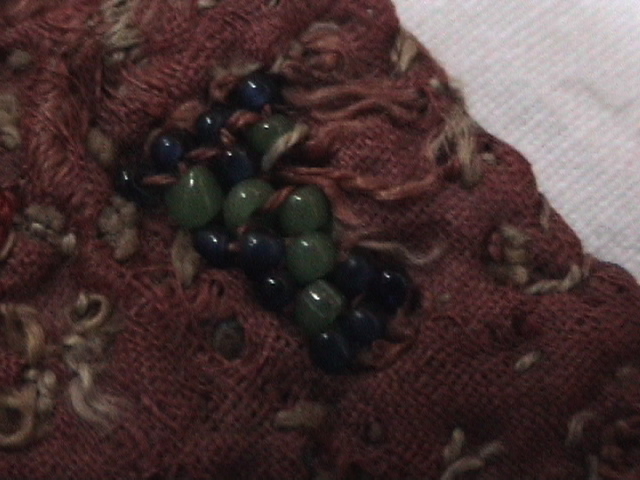 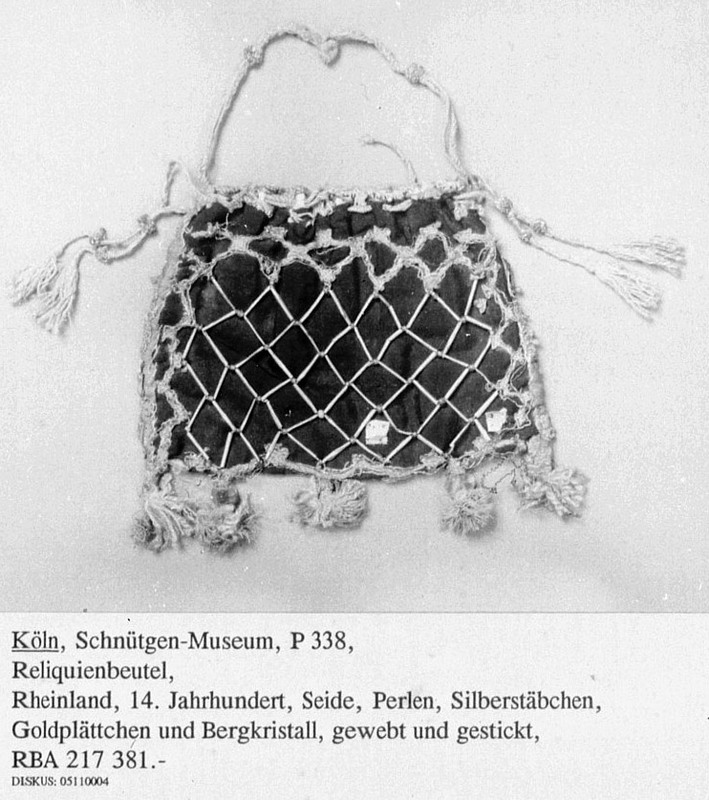 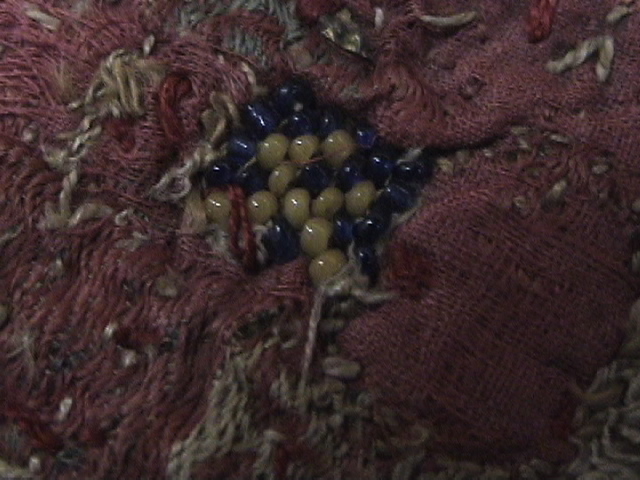 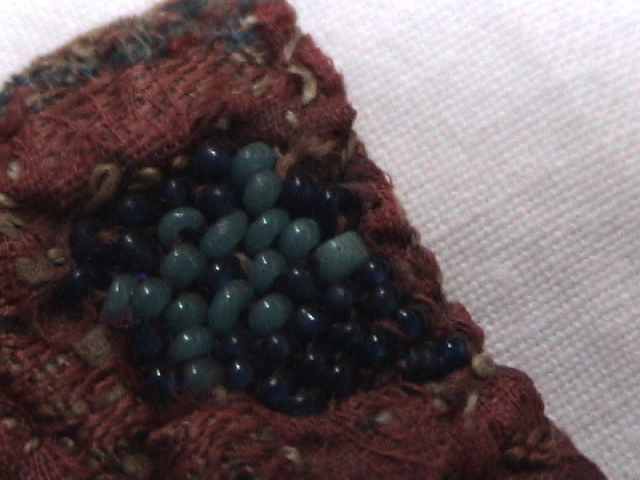 Therefore, for the Lower Saxony beadwork – to which the Mitra belongs – pearls from the provenances of the Lüneburg Heath may well have been used. 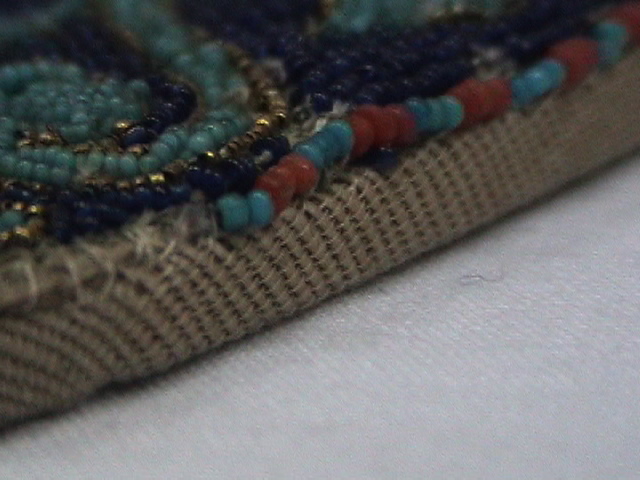 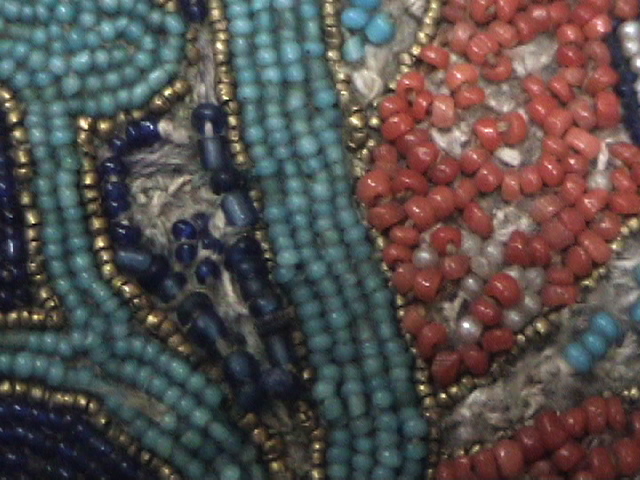 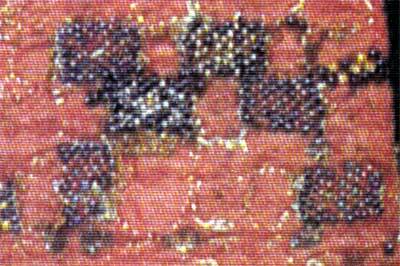 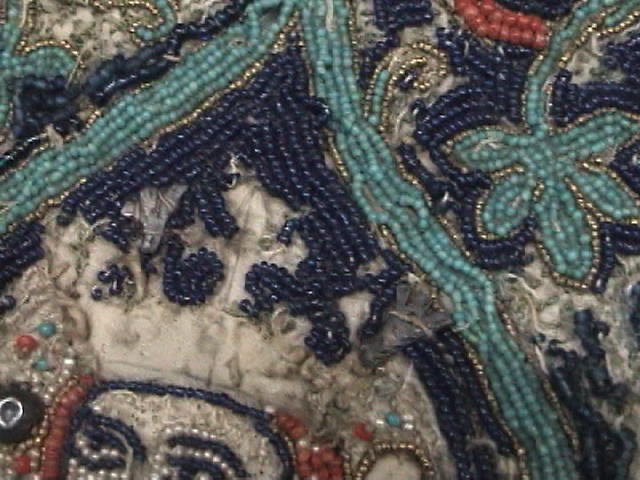 The background for the beadwork, which is embroidered on pattern-precise parchment, is a thin gold foil. 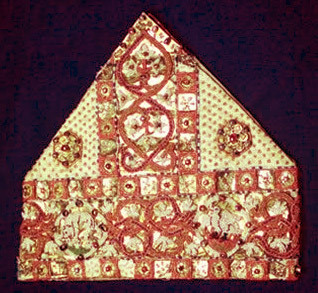 The two decorative bands, called Circulus and Titulus, are particularly broad and elaborate on this Miter . 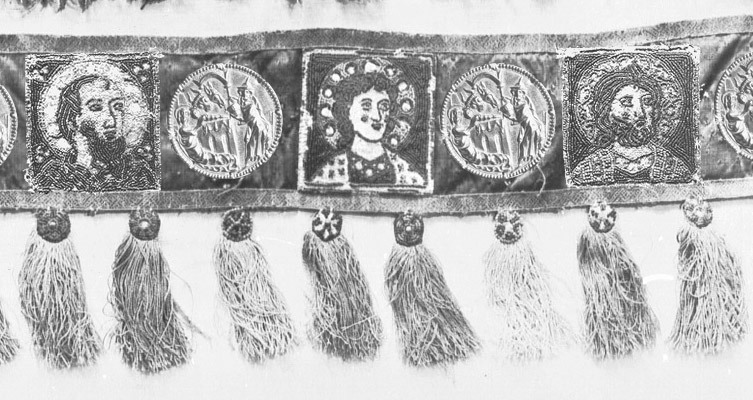 Horizontally, the Mitra move around many entwined tendrils with vine leaves, into which two quadruple-shaped medallions are integrated on the front and back. 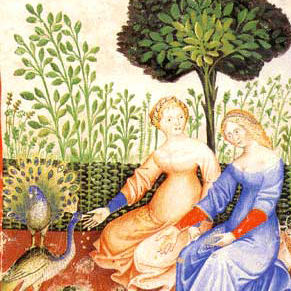 In miniature they depict representations of medieval animal symbolism, which was recorded in the compendium of the Physiologus, which has been immensely popular since early Christian times: On the detail illustration of the obverse, an eagle flies out of its nest with a young bird in its capture. 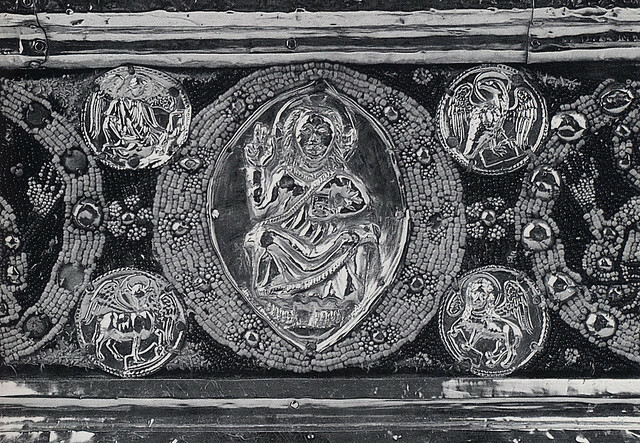 In the interpretation of salvation history, the eagle Christ immediately approaches the sun, the symbol of God, to whom he feeds a human child. 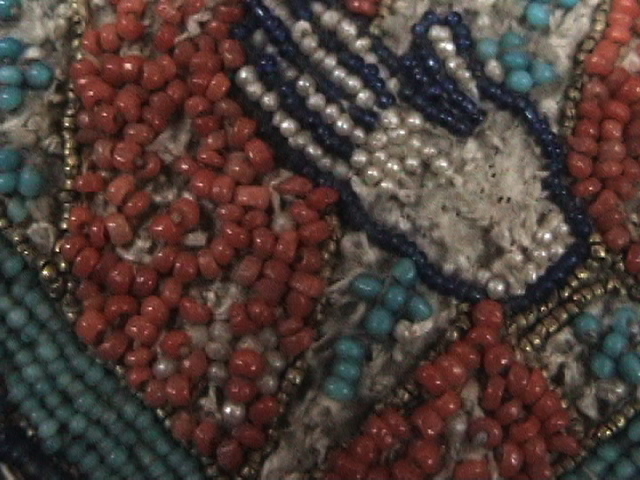 In the neighboring medallion, the pelican, animating and nurturing the young with his blood, is shown. 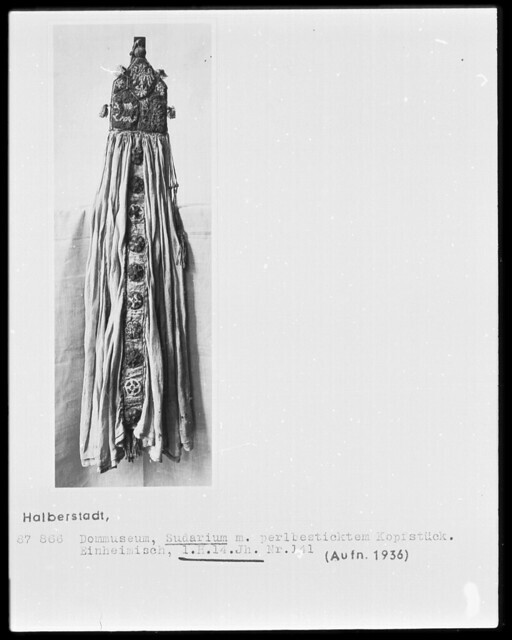 On the opposite side, the Phoenix rises from its ashes with its wings spread wide , and a lion bends over its still-born, unbroken boy to bring it to life with his breath . 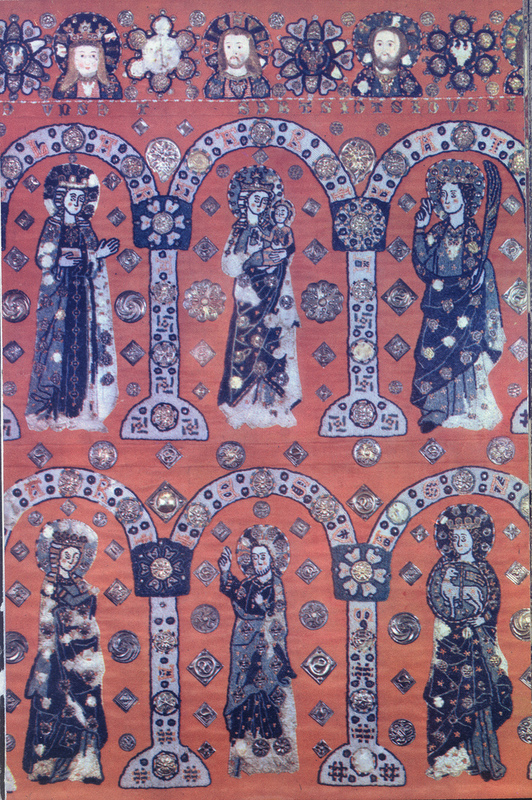 All four motifs are allegories of the resurrection of Christ and symbolize the Christian hope of the resurrection of the dead. 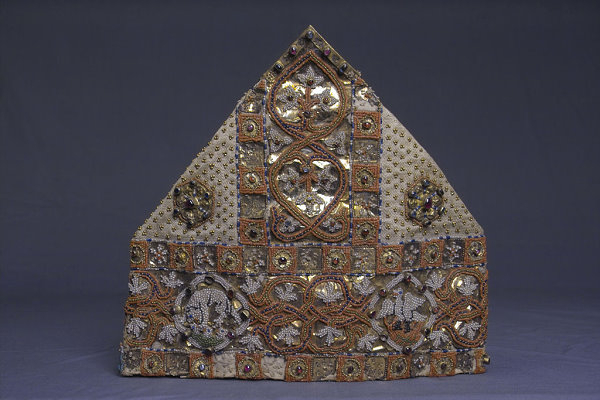 This central content of faith finds a visible expression in a special way in the celebration of Easter, for which occasion the precious miter was probably determined. 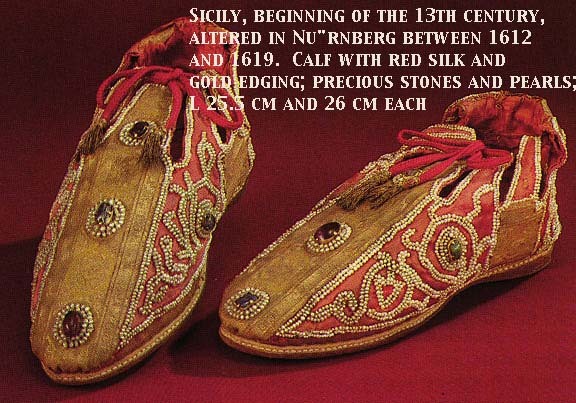 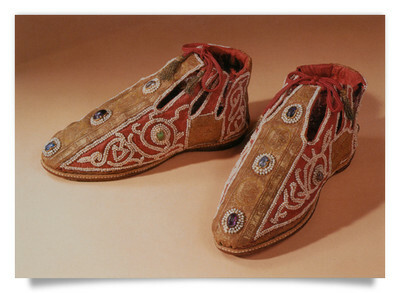 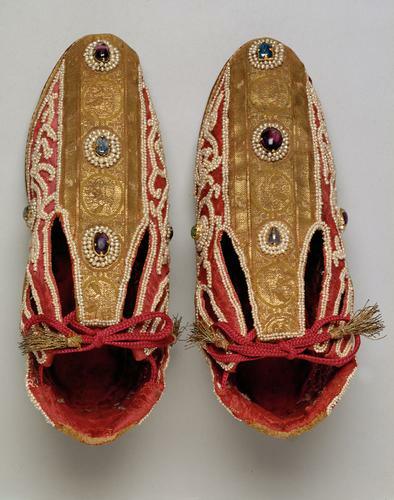 Like the gloves, these shoes were presumably made before 1220 for the Emperor Friedrich II. 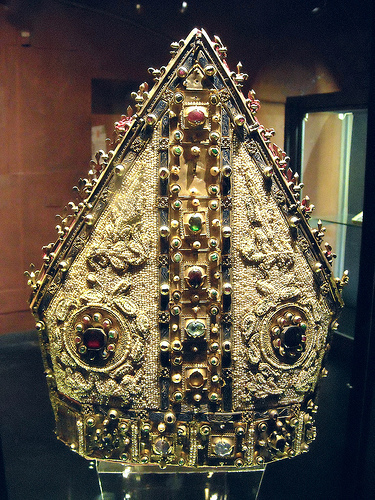 “In 1942, in the monastery of Santa Maria de los Regalis Huelgas (Burgos, Isapniya), served as a place of coronation and burial place of Spanish kings from the time of its founder, Alfonso VIII, was the tomb of Fernando de la Cerda, the eldest son of Alfonso X of Castile. 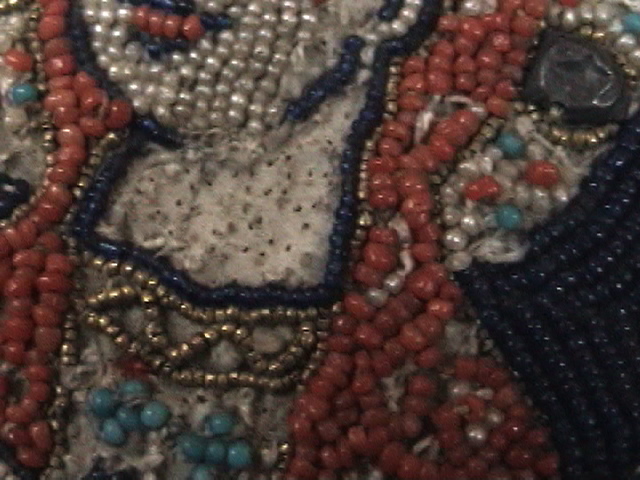 Inside the tomb stone was placed the body 19-year-old Infanta in a luxurious, richly embroidered silk dress. 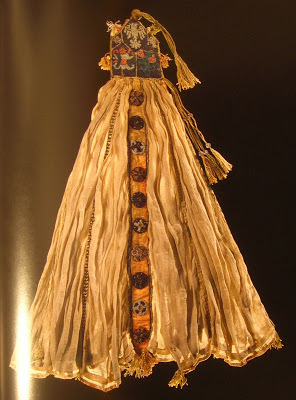 Mastery of work, wealth and beauty, and not inferior to the waist, the waist is on the Infanta. 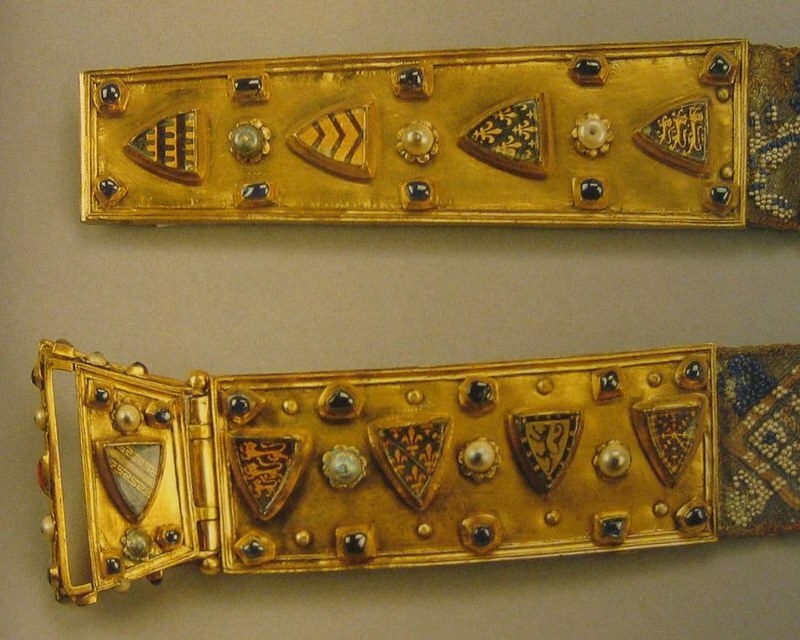 This belt, unlike other clothing, jewelry heraldic symbols of Castile and Leon, had the marks of the royal houses of England, France and Navarre; presumably on the buckle emblem of Champagne. 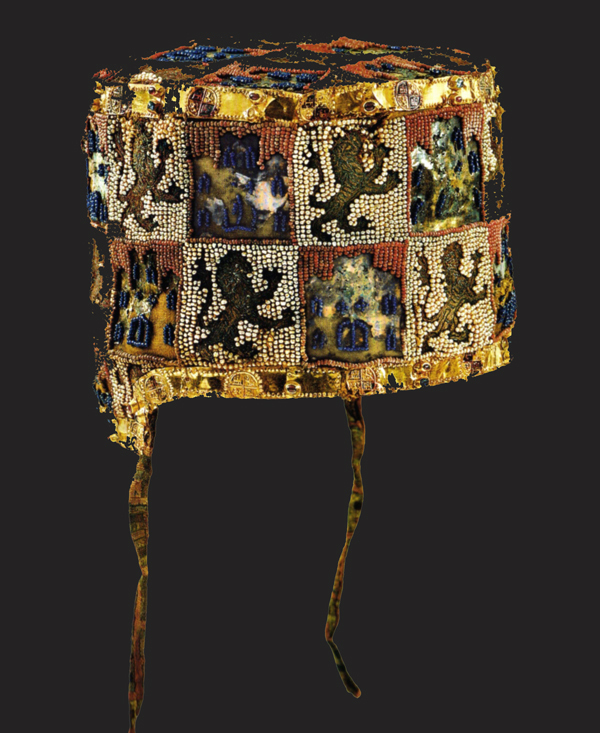 On the belt, there are also nine other heraldic symbols, not known in the thirteenth century Castile. 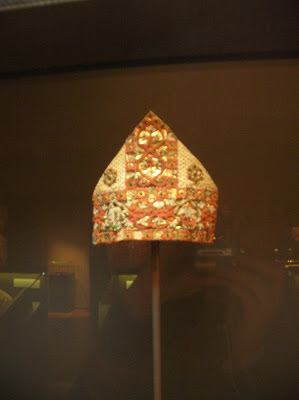 Where does this thing and whose work he did not know until now, but there is debate about the three versions of its origin: Spanish, French or English. 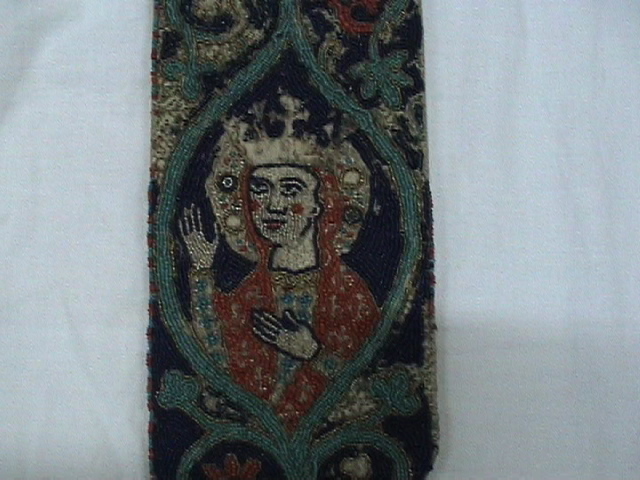 Basis belt size 1920 mm long and 42 mm wide was woven on the plates and decorated with tiny blue and white glass beads. 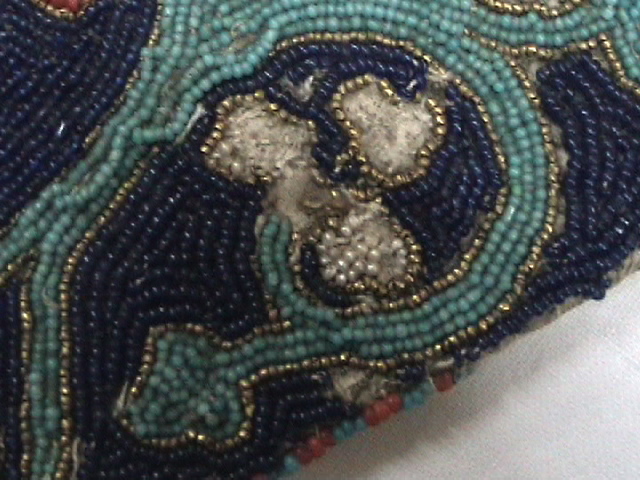 Inner face with black light green silk embroidered with gold thread. 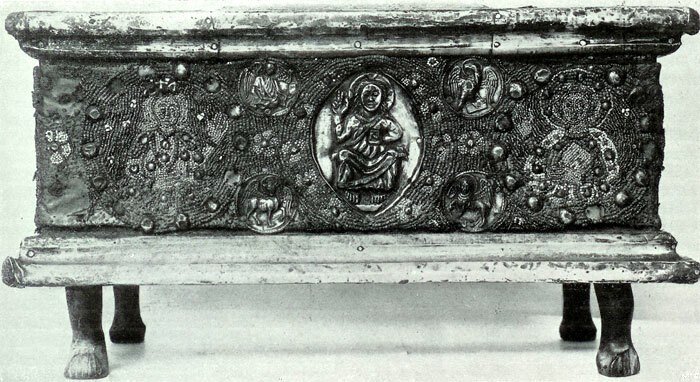 Both ends of the belt are attached two silver gilt plate about 150 mm long. 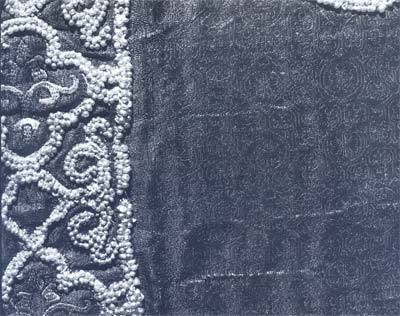 To one of them is fastened the buckle and the other serving as the shank, has a trapezoidal shape and tapers somewhat towards the end. 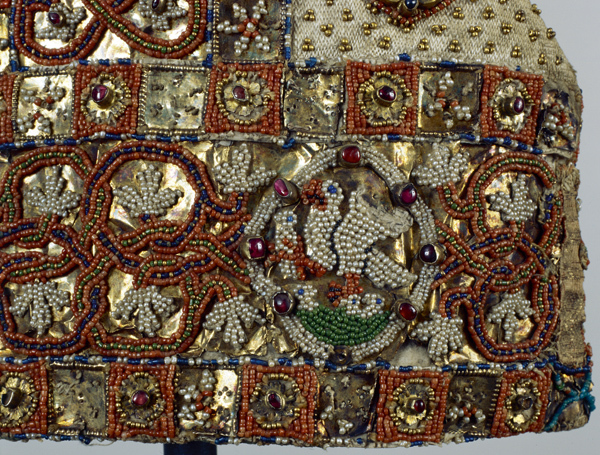 Both plates are decorated with pearls and sapphires, each taken four coated with a thin layer of enamel shield with heraldic images. 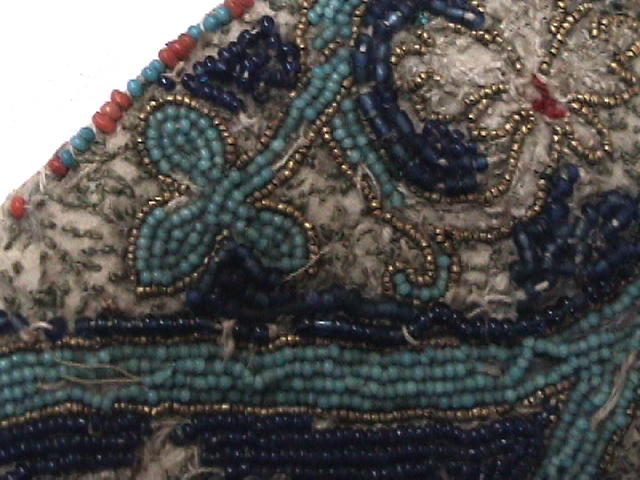 Heraldic shields placed on the shank, rotated by 90 degrees with respect to all the others who are on the belt. 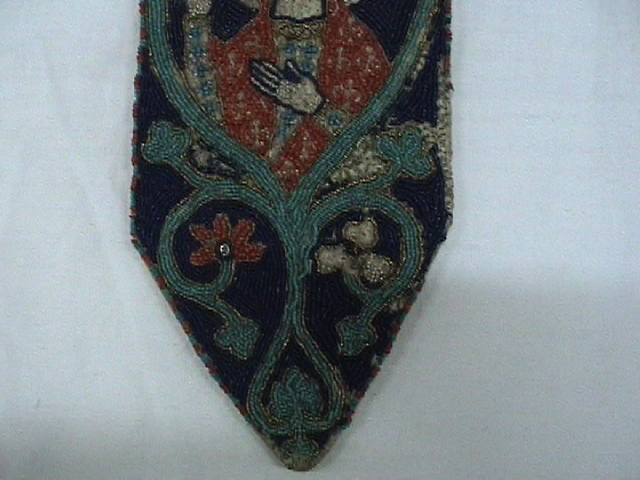 This testifies to the manner of wearing this belt, which included hanging Shank – like the image is on the statue of King John Lackland of England (1199 – 1216), which is in Worcester Cathedral. 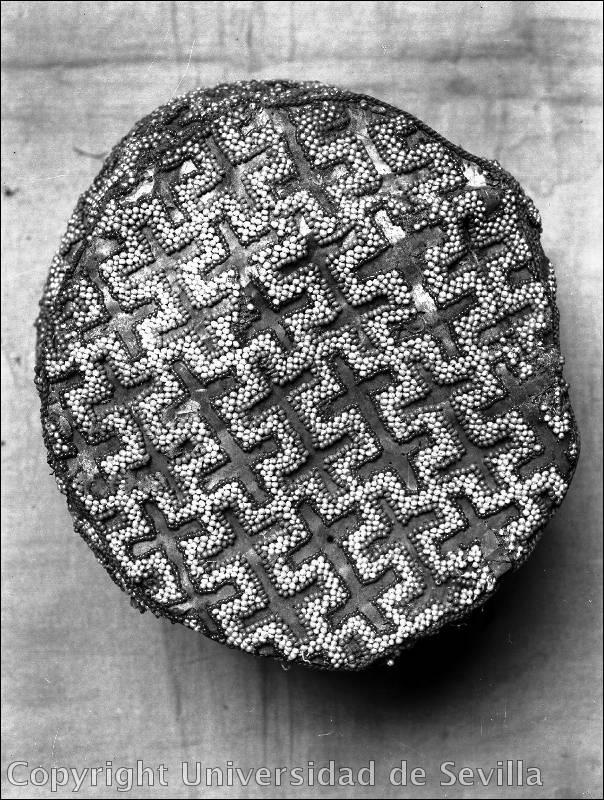 Belt buckle has a trapezoidal shape. 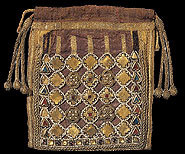 Its hinged lid, designed to regulate the length of the belt and clip it at the right place, is one tripartite shield. 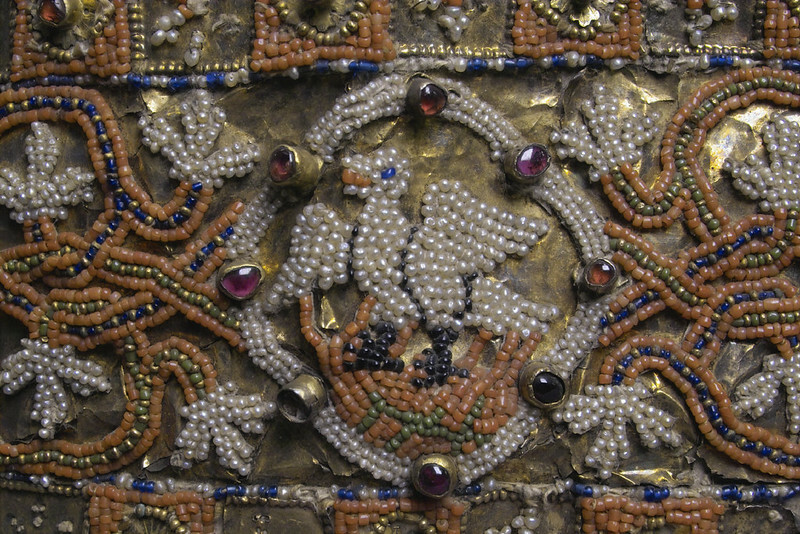 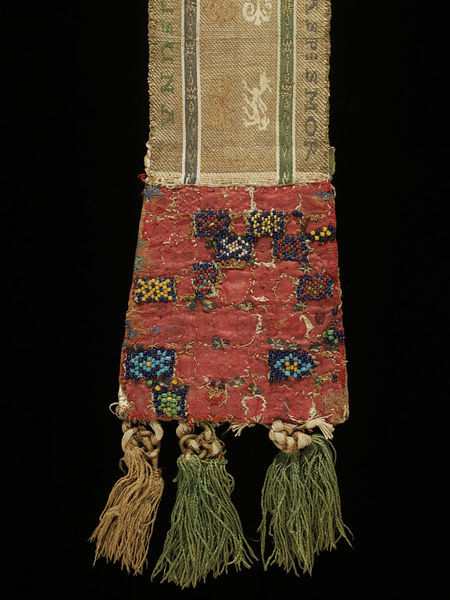 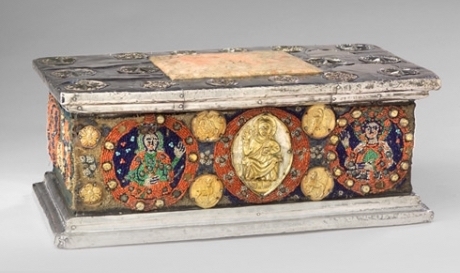 Cover decorated with pearls, sapphires and one carnelian. 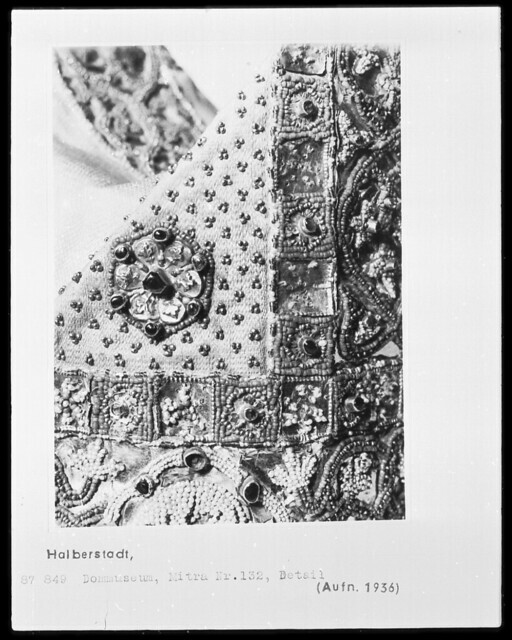 19 silver gilt belt pads divide into 20 equal parts by 75 mm. 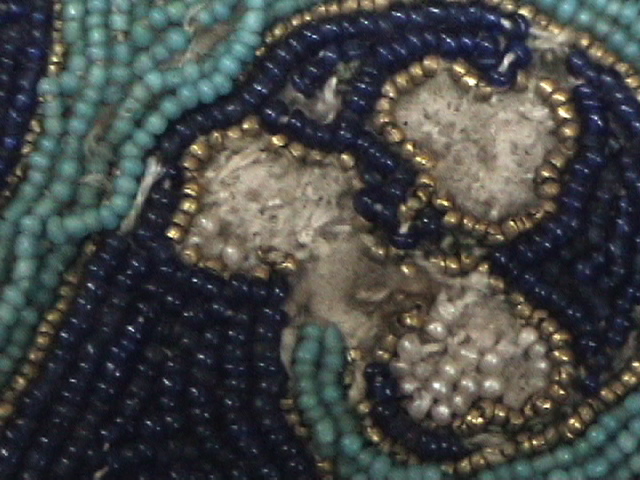 Each pad is attached on both sides, in the center – the pearl inset. 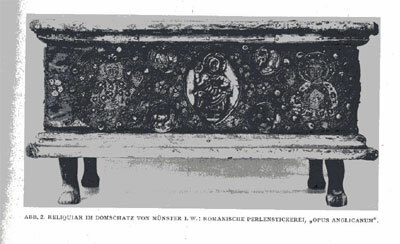 Arched suspension-mount disposed between the first and second plates (counting from the buckle). 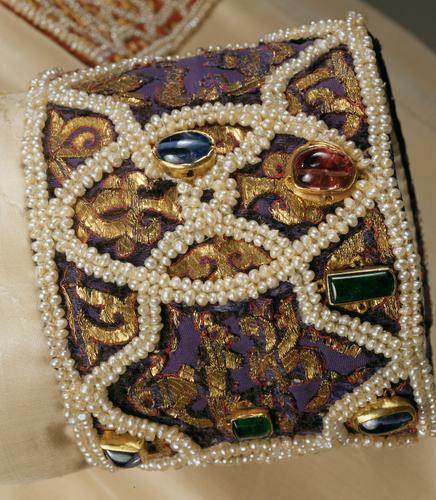 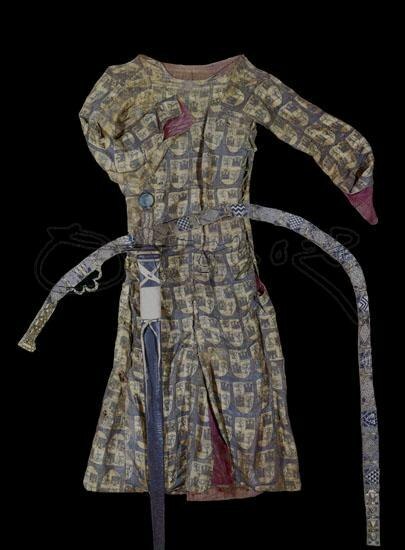 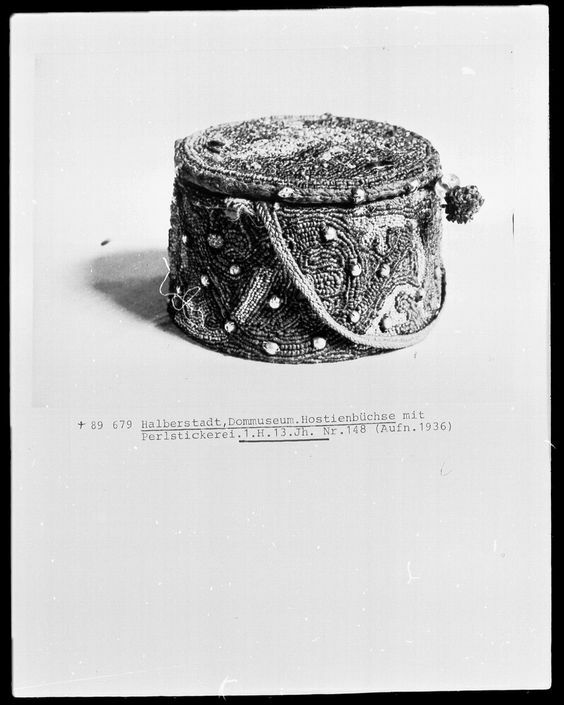 It is also made of gilded silver and decorated with pearls and sapphires, repeating motif buckle and tang. 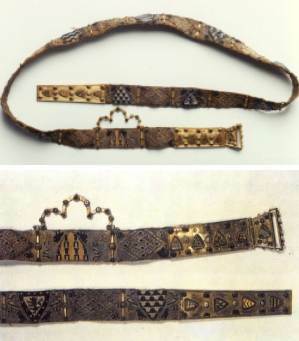 20 sections belt decorated with alternating patterns. 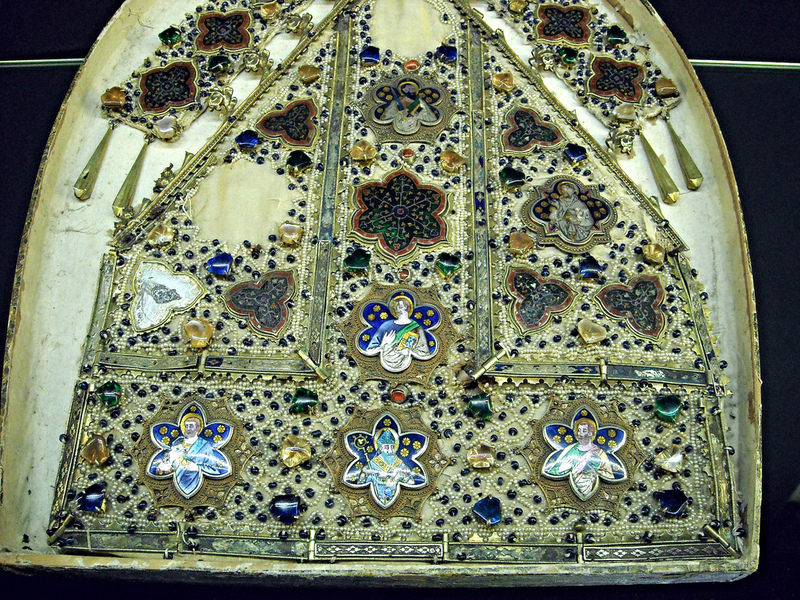 10 of them are filled with intricate geometrical ornament in diamond-shaped framework, none of the images are not repeated, although they are very similar – including on a blue and white color scheme. 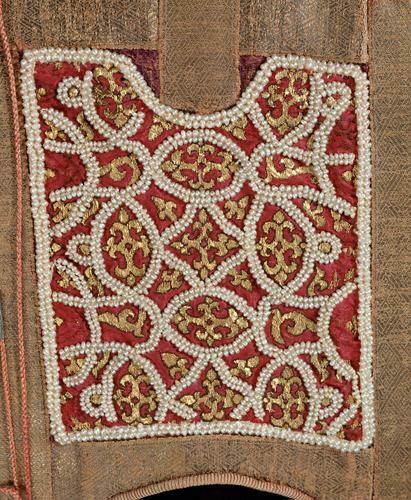 10 other sections filled constituents heraldic shields, some of which are repeated also on the buckle and the shank. 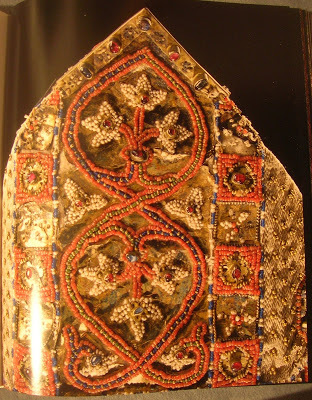 Shields also made ​​in white and blue color, so it is unlikely that they reflect the actual color shown on them emblems. 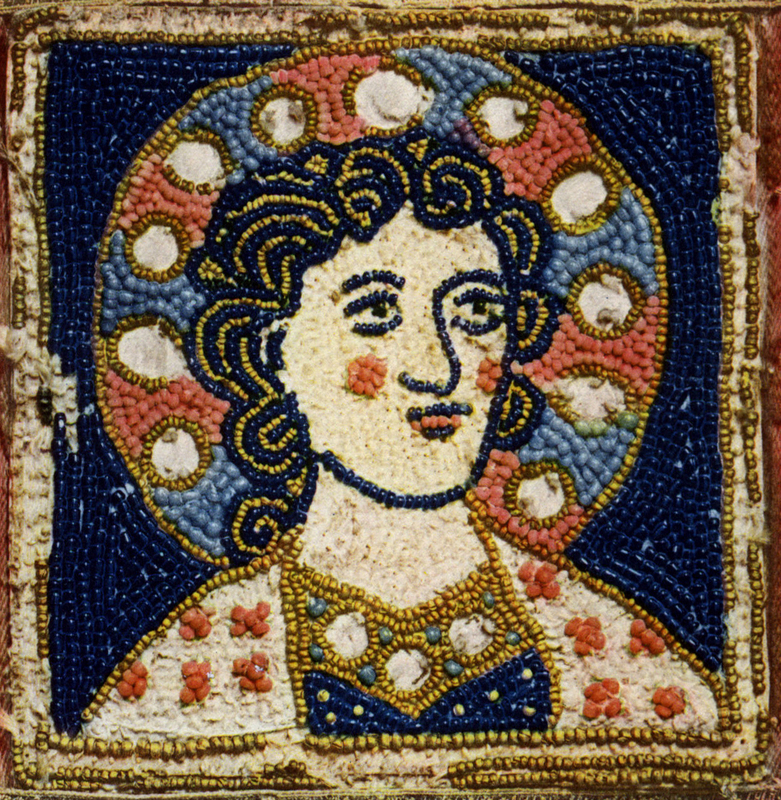 White and blue colors were not a couple inherent Heraldry Europe XIII century. 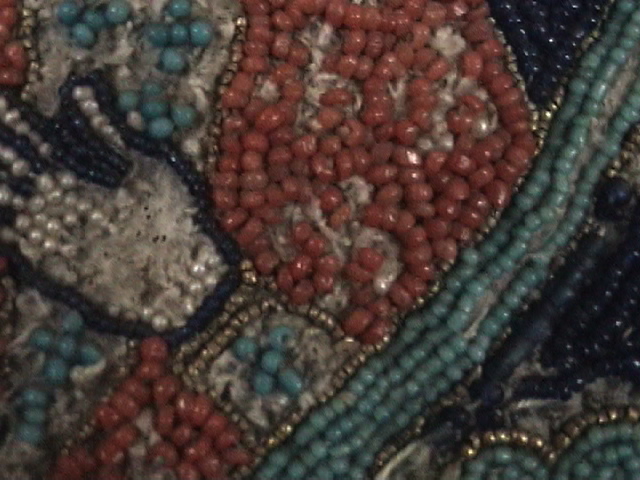 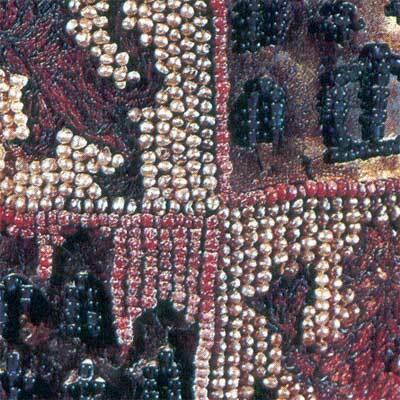 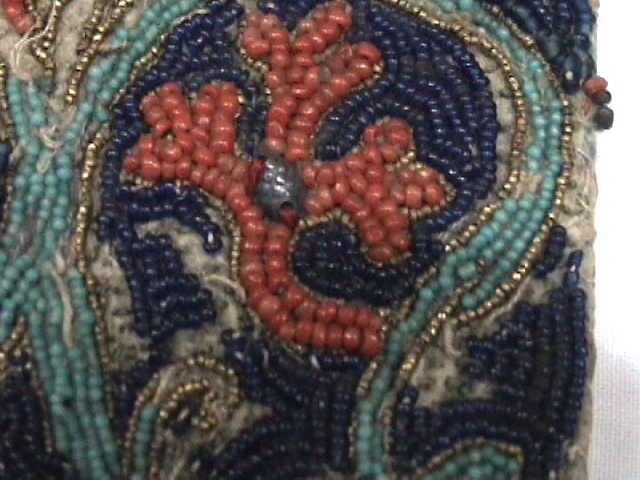 Shields keep embroidered with white beads birds sitting on divided into 8 segments wheels. 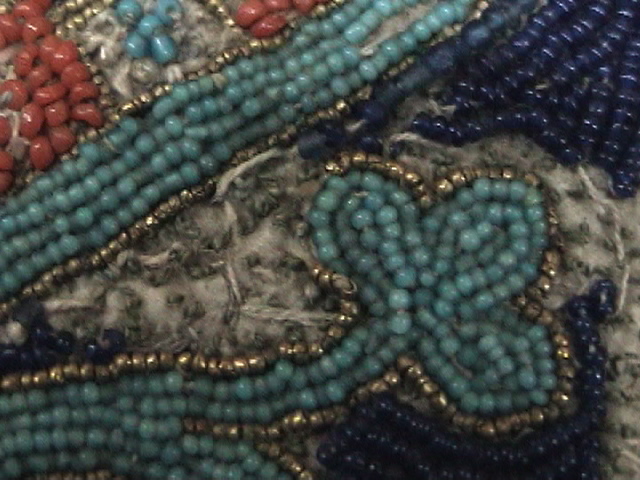 The remaining space between the wheel and shield busy little blue birds. 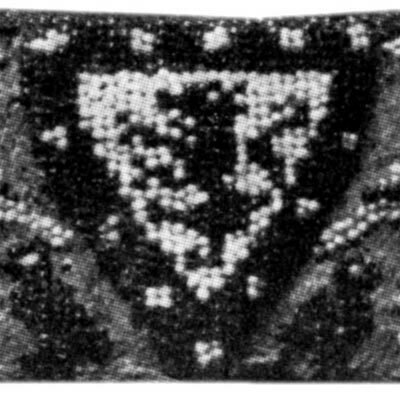 Attempts to identify the heraldic symbols of those boards still causing heated debate and has not been successful: no consensus on this issue has not been worked out.” — According to the article by Benjamin L. Wild (2011): Emblems and enigmas: Revisiting the ‘sword’ belt of Fernando de la Cerda, Journal of Medieval History, 37:4, 378-396. 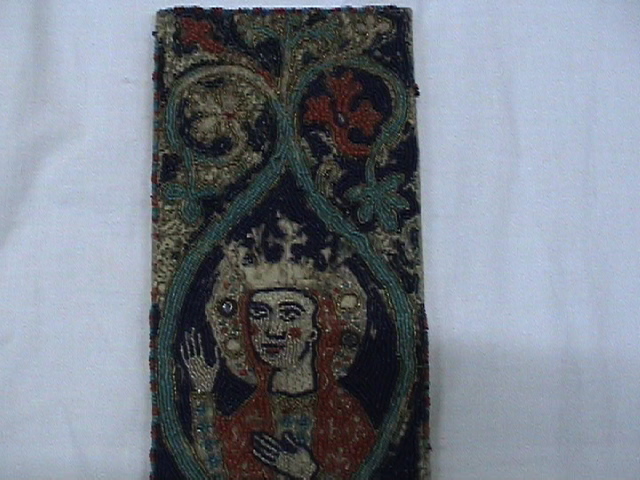 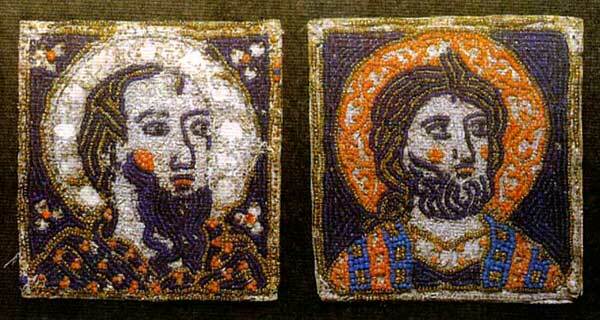 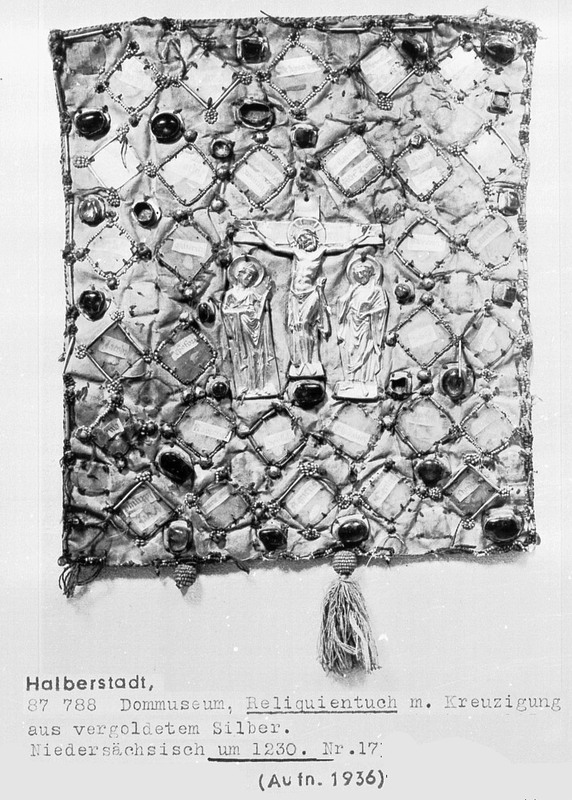 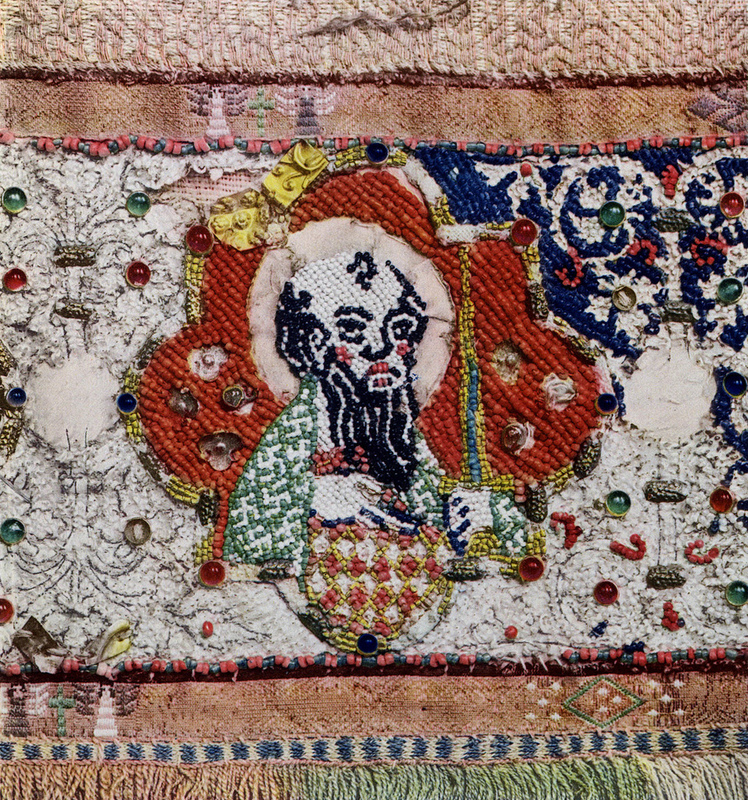 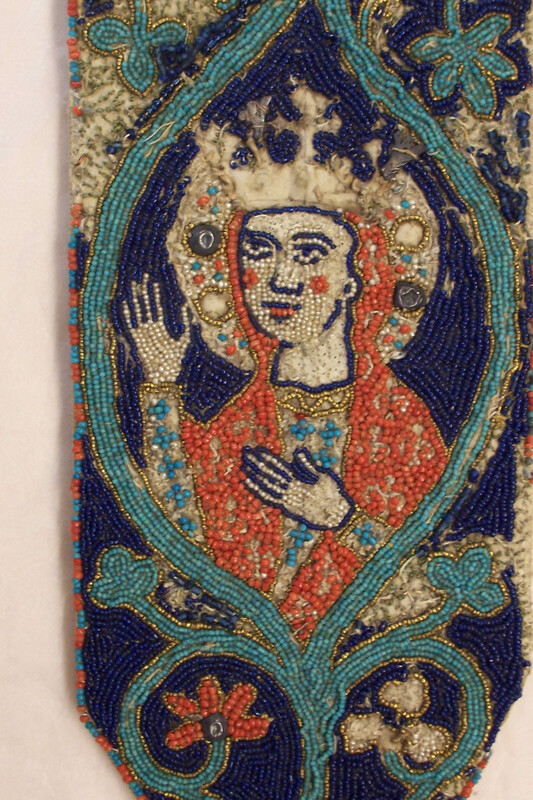 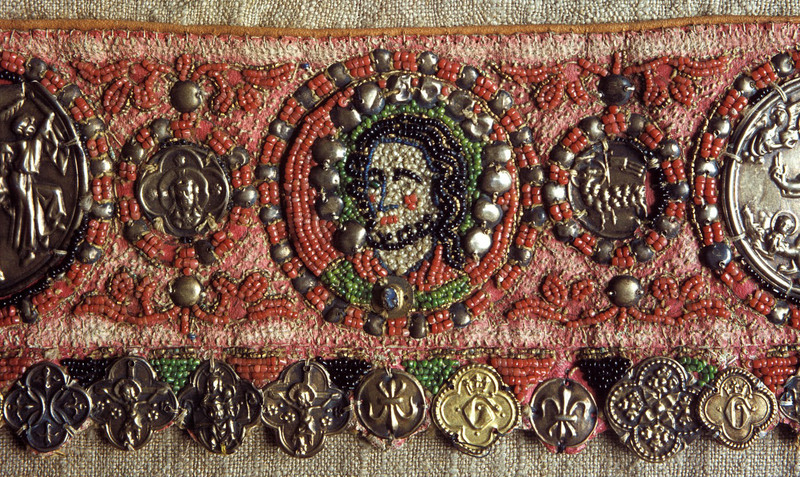 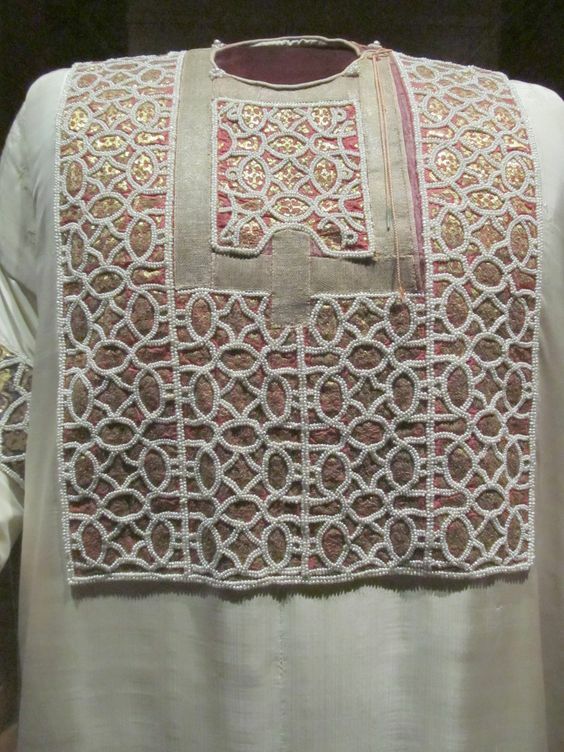 In some sources this pointed orphrey end is often paired with two bead saints heads, from the same museum since they are similar in time frame, and materials. 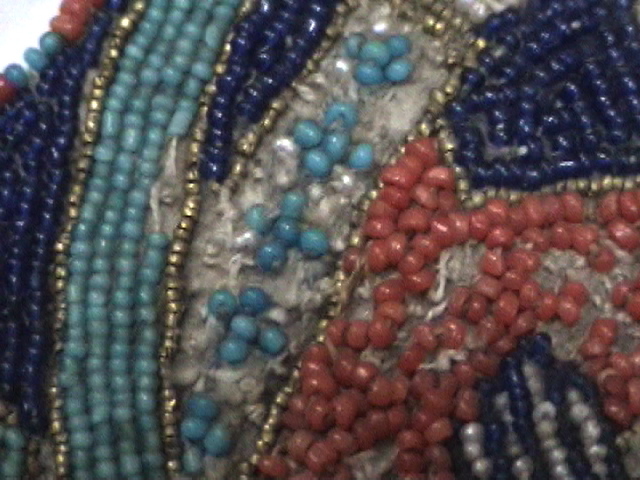 Since they are not from the same piece I am seperating them. 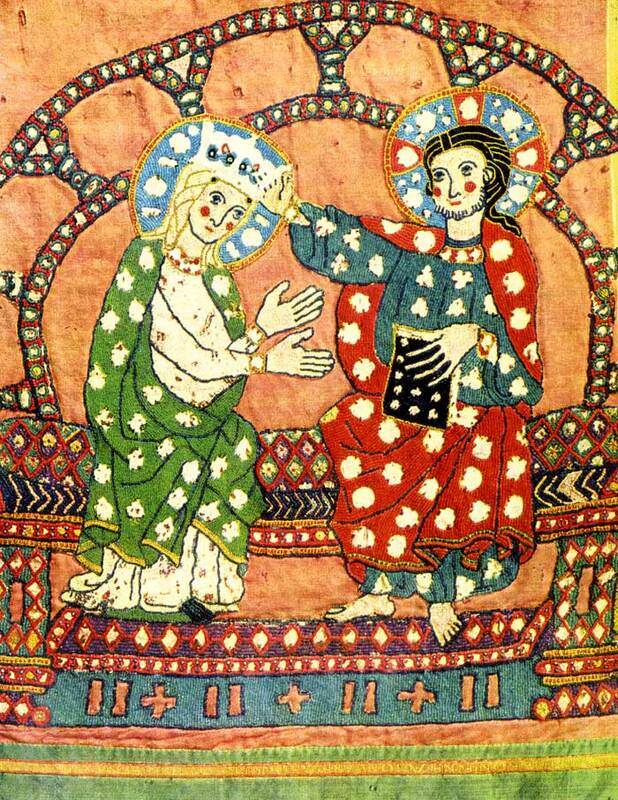 “Manipel”, First half of 13th Cen. 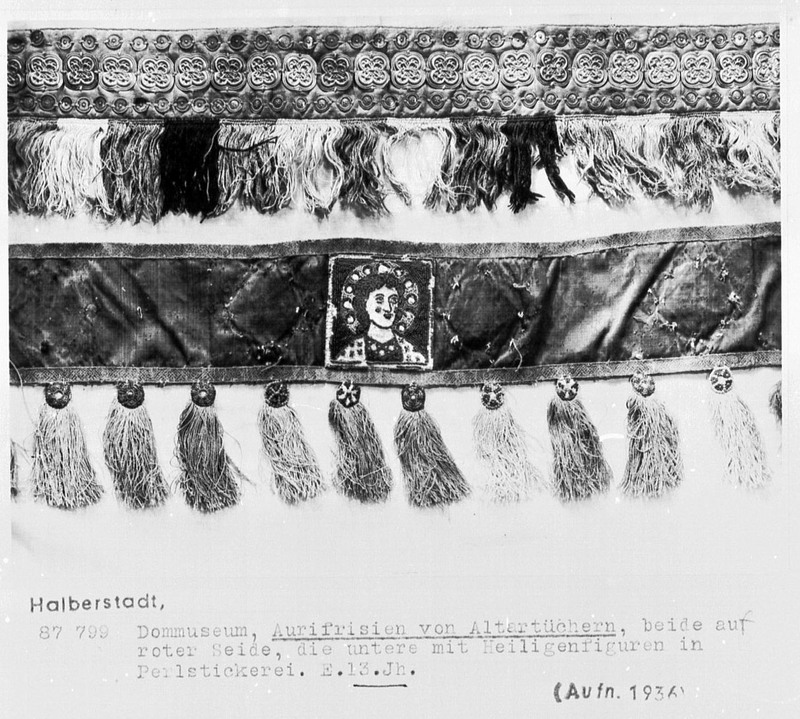 In German: Auf dem Mittlestreifen der goldborte finden sich, jeweils paarweise, Vierfüßler, Vogel, baumchen bzh, palmetten, seitlich davon schmale streifen mit Kette aus Rauten – und Winkenhakenformen in gold auf grunbzh. 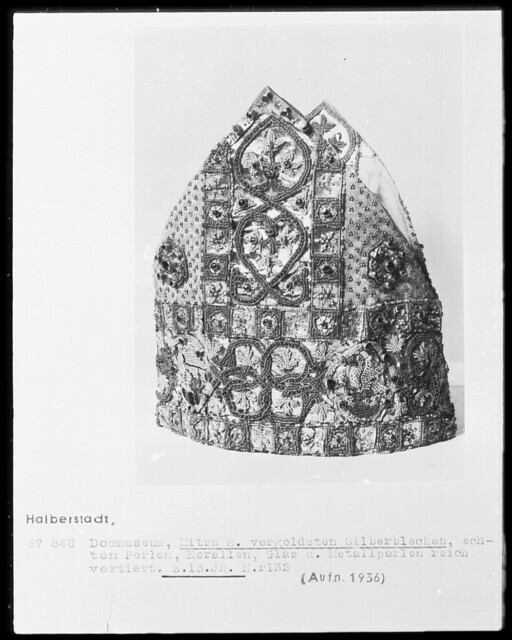 Viloett. Closeups are from my Visit to the V&A visit, read notes here. 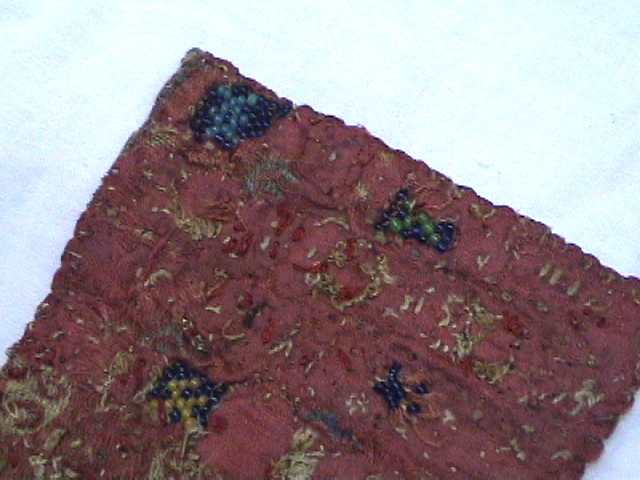 Red silk. 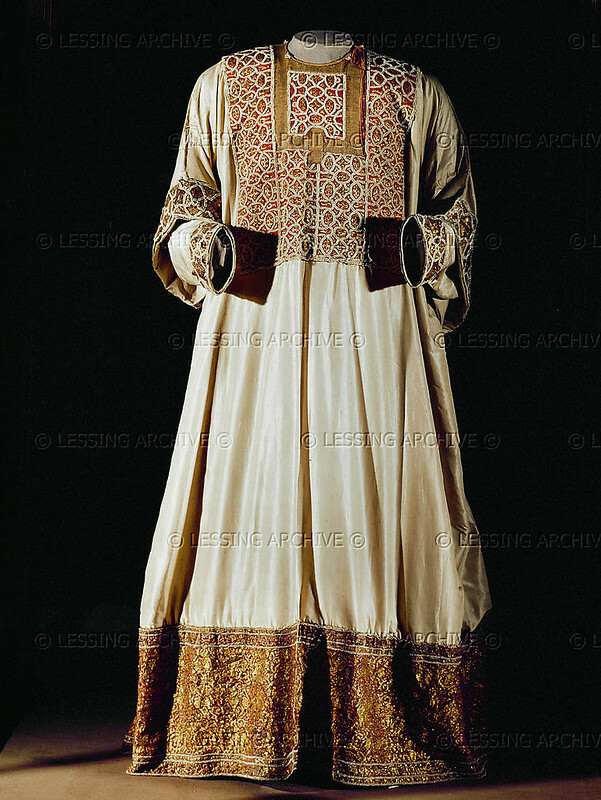 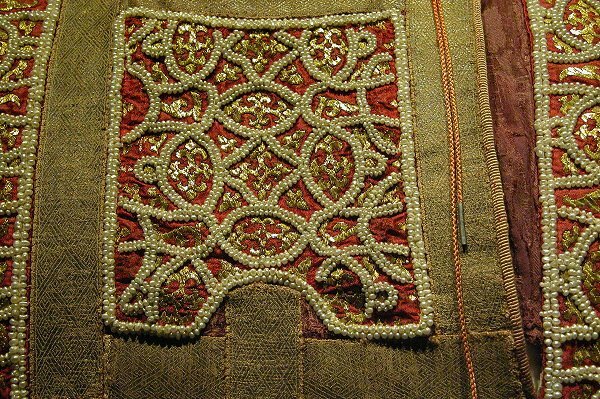 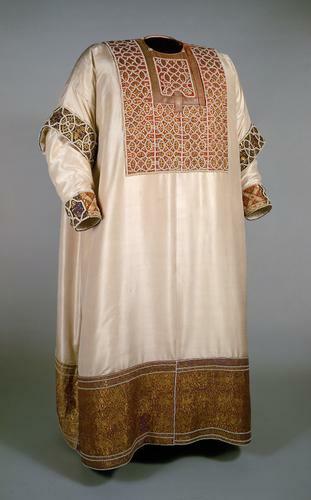 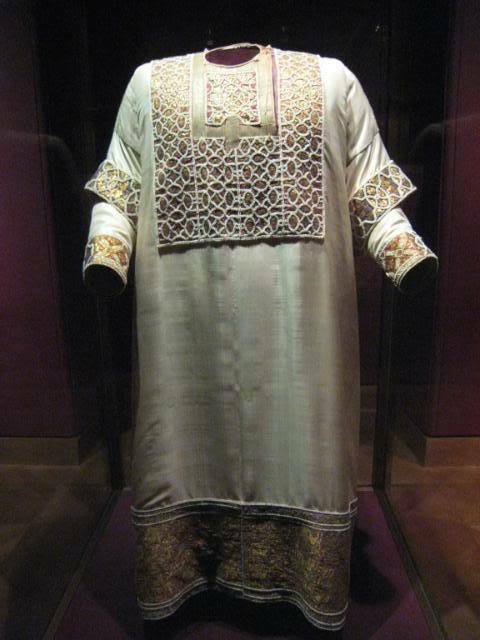 Gold embroidery in couched work. 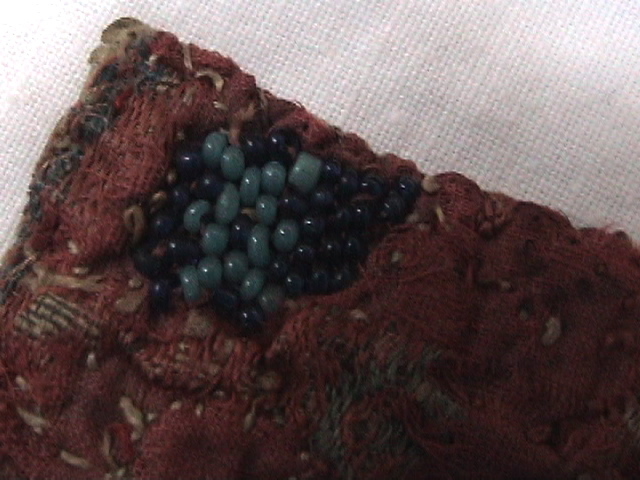 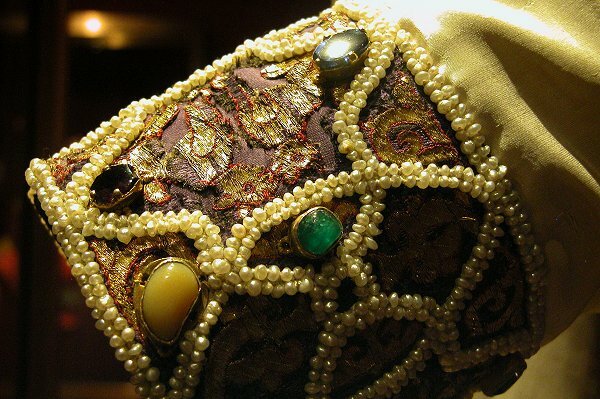 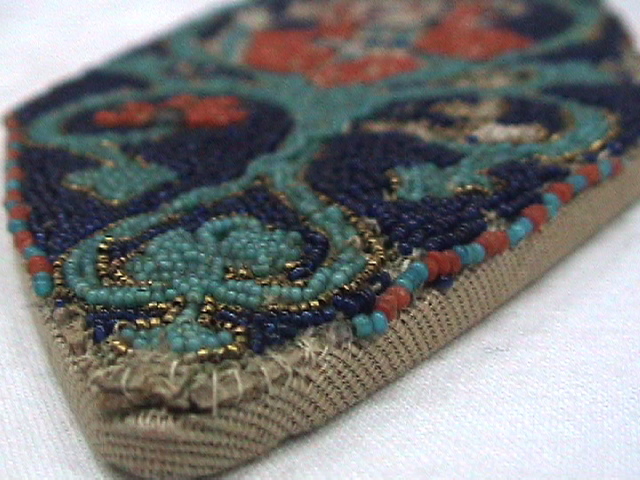 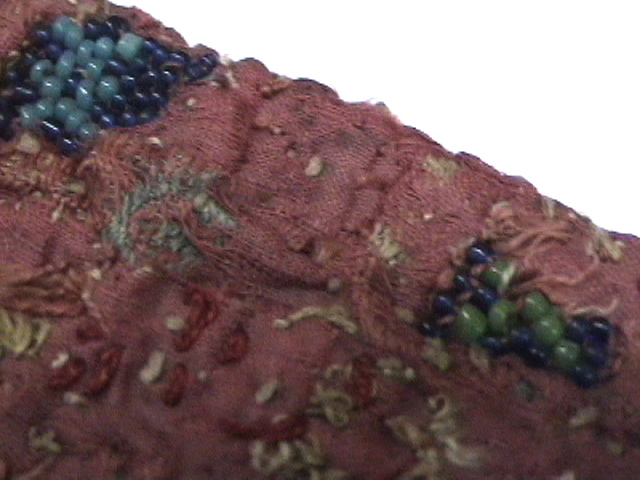 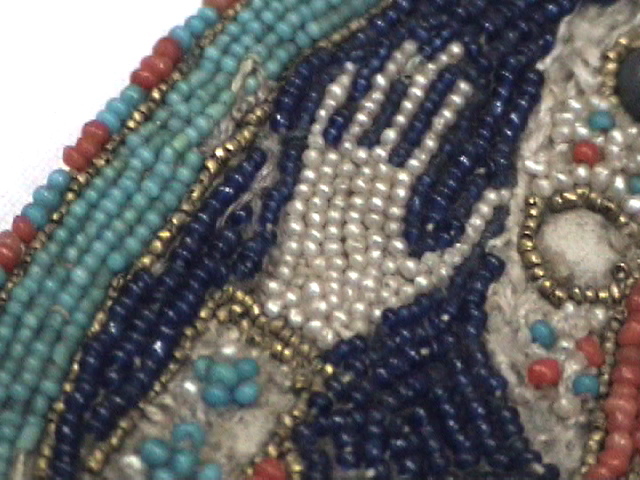 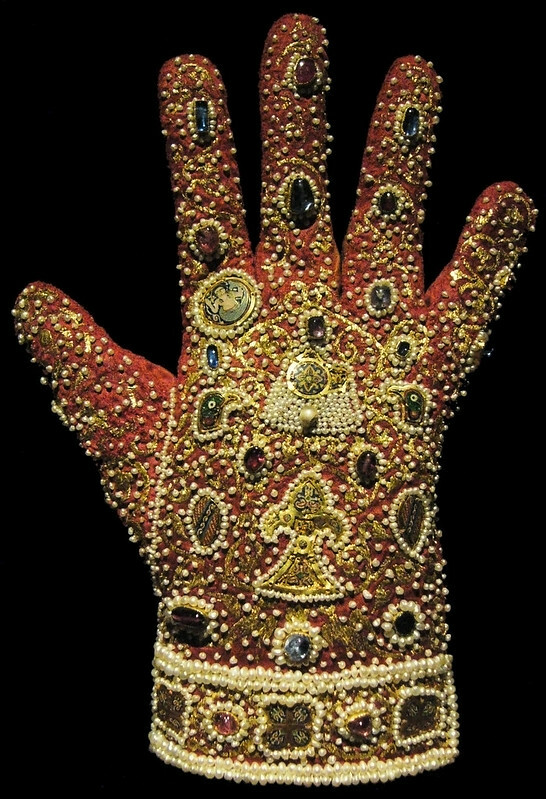 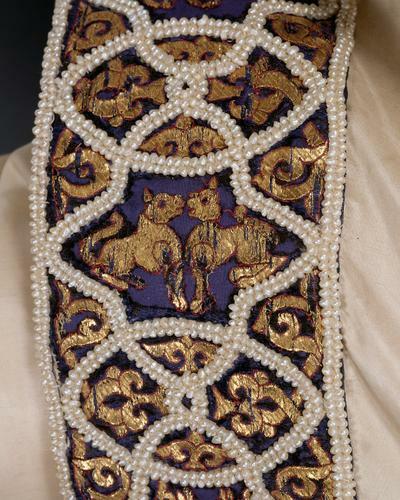 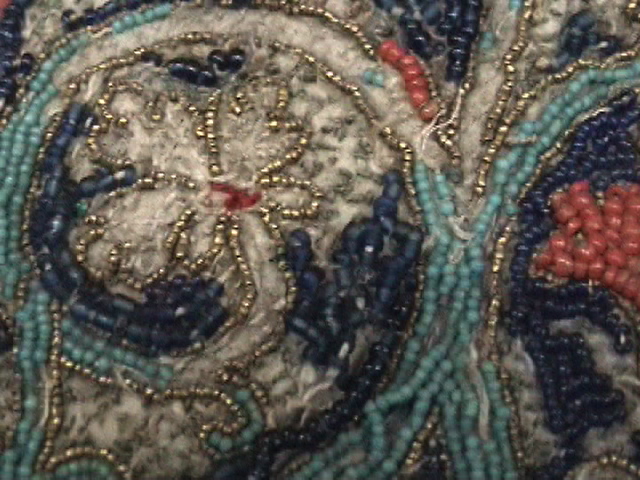 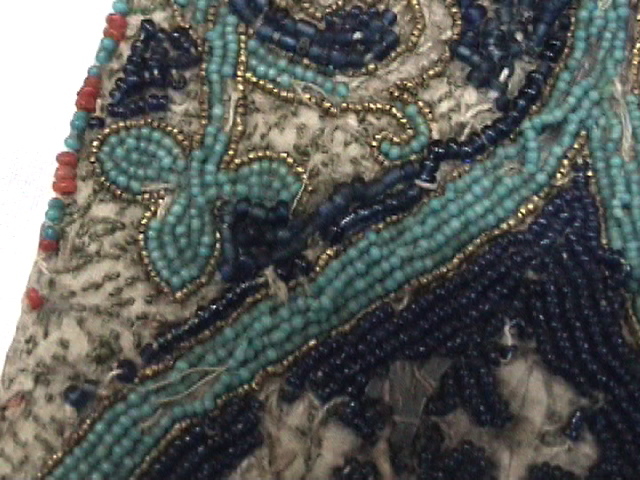 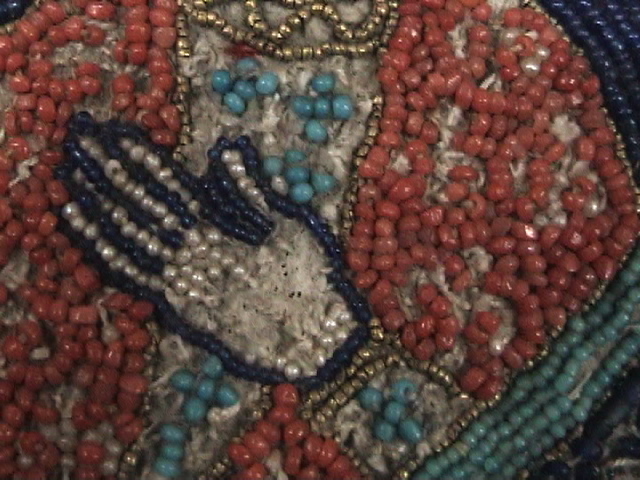 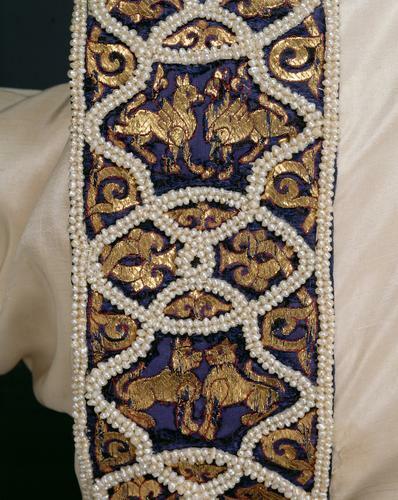 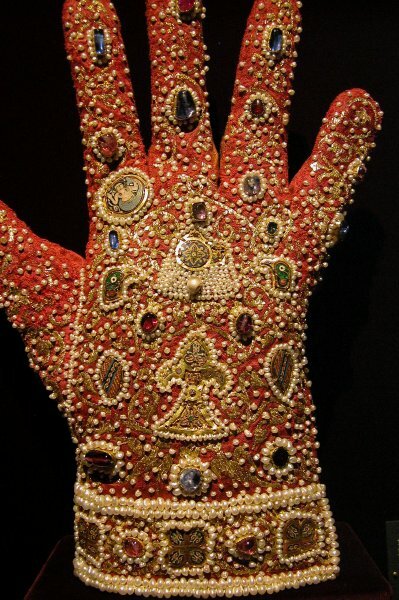 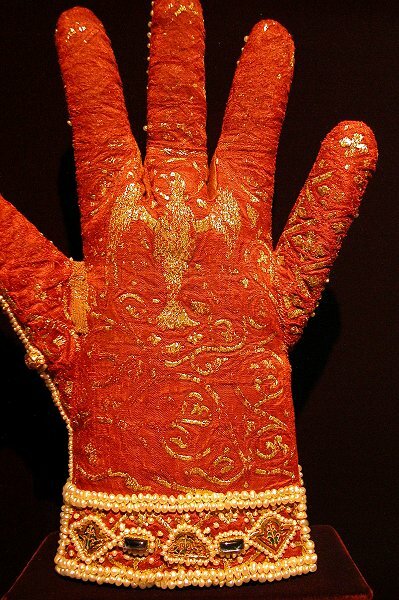 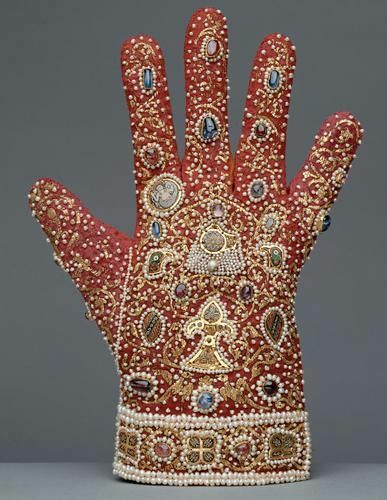 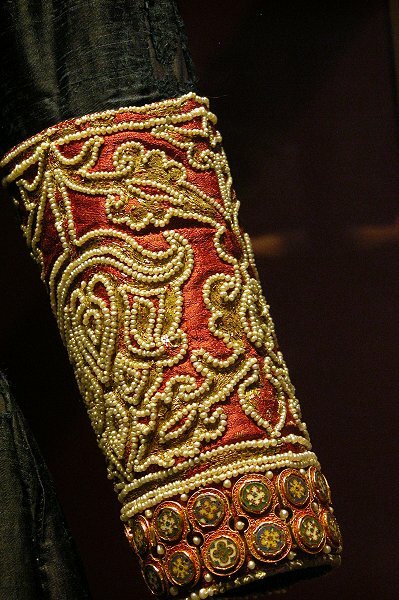 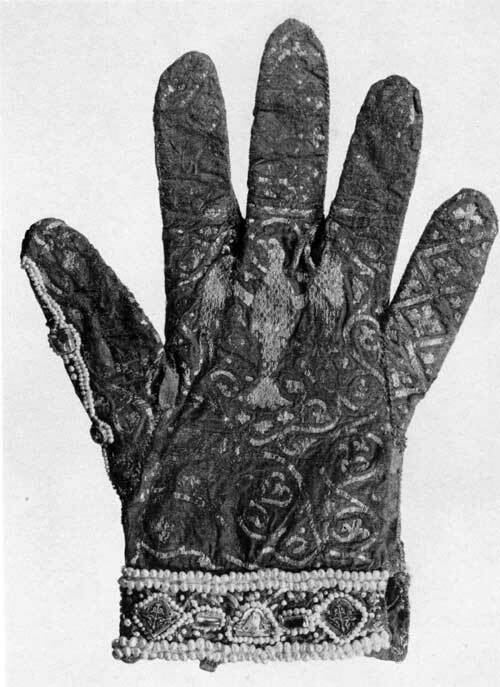 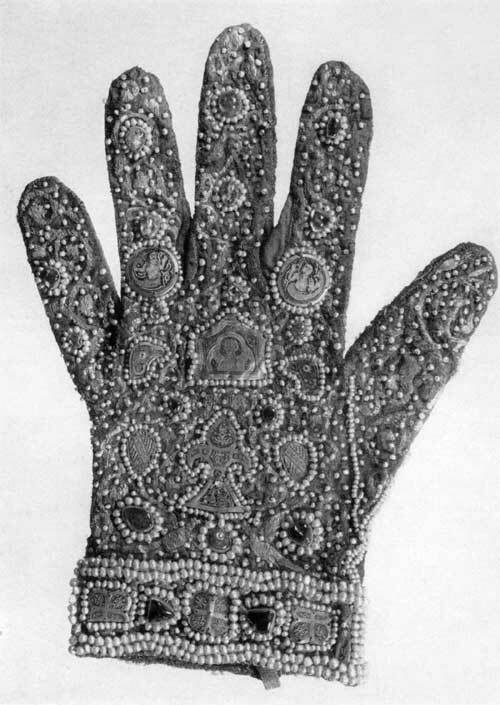 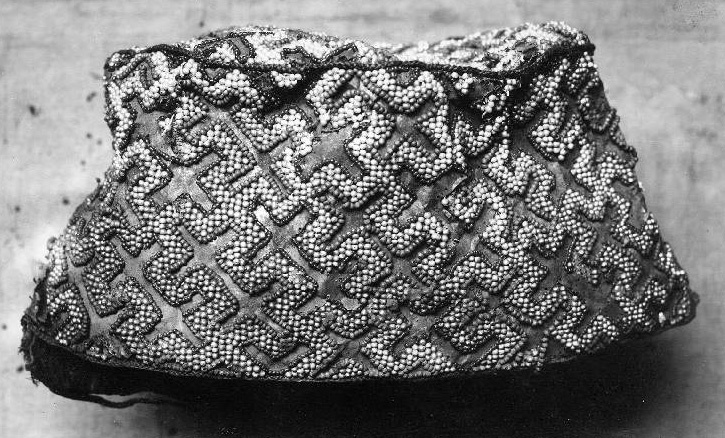 The back of the hand is rechley embroidered with pearls, rubies, sapphires and enamelled plawues (four of the latter have been lost and replaced by others). 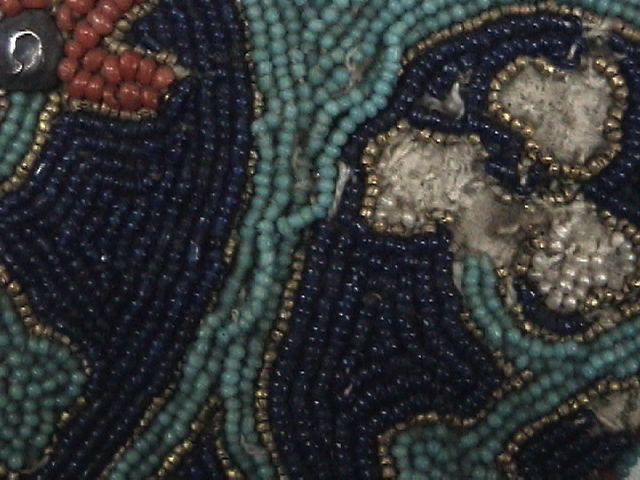 On the inner side, a single-headed nimbed eagle. 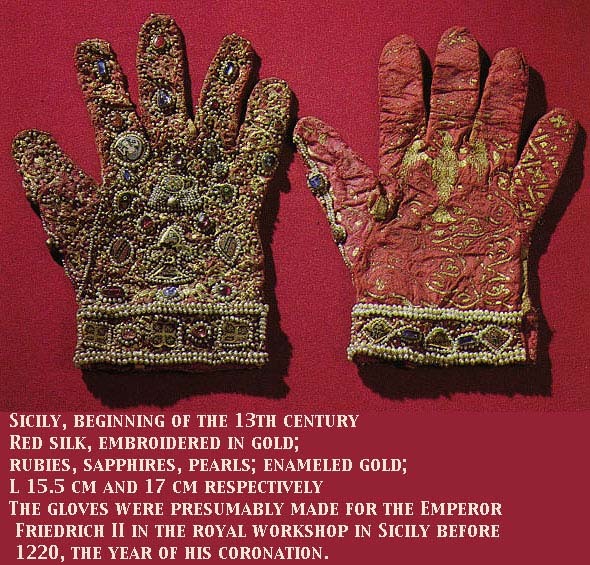 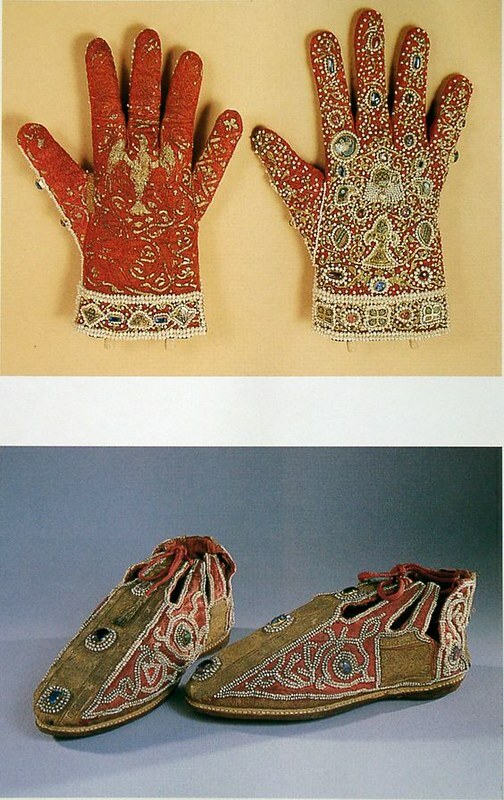 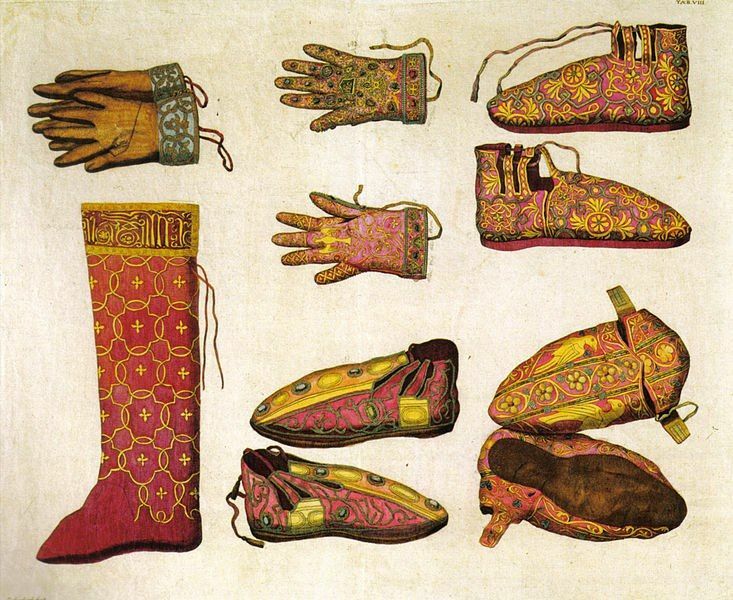 The gloves were made in the Royal Workshops of Sicily for the Emperor Frederick II and were worn by him at his coronation in 1220. 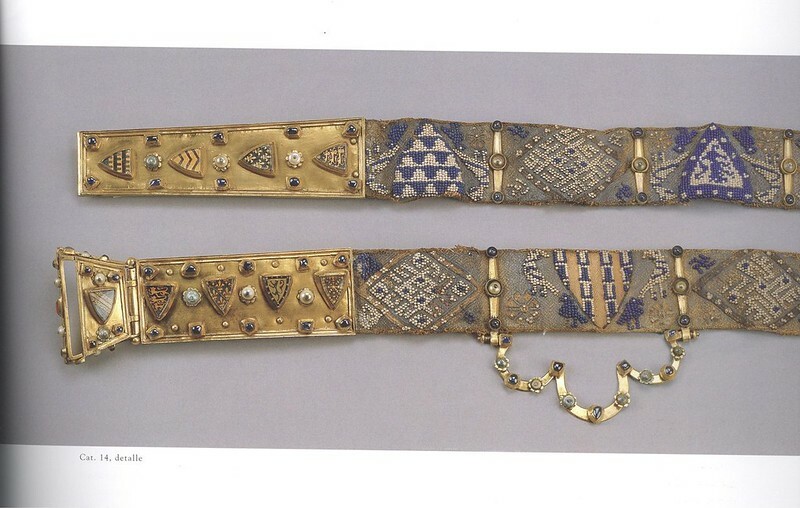 According to the article by Benjamin L. Wild (2011): Emblems and enigmas: Revisiting the ‘sword’ belt of Fernando de la Cerda, Journal of Medieval History, 37:4, 378-396. 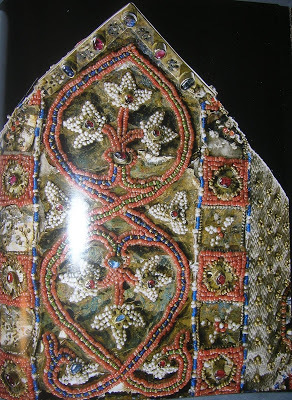 In 1942, in the monastery of Santa Maria de los Regalis Huelgas (Burgos, Isapniya), served as a place of coronation and burial place of Spanish kings from the time of its founder, Alfonso VIII, was the tomb of Fernando de la Cerda, the eldest son of Alfonso X of Castile. 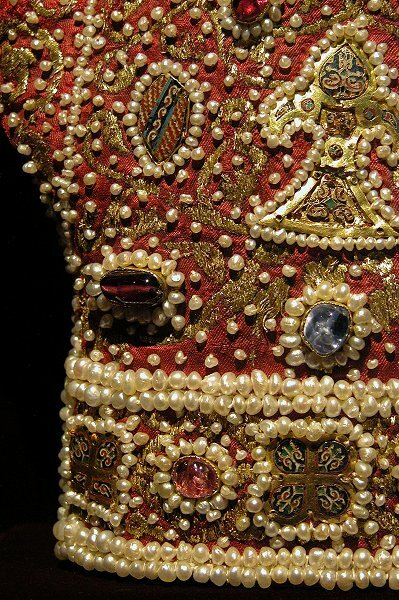 Inside the tomb stone was placed the body 19-year-old Infanta in a luxurious, richly embroidered silk dress. 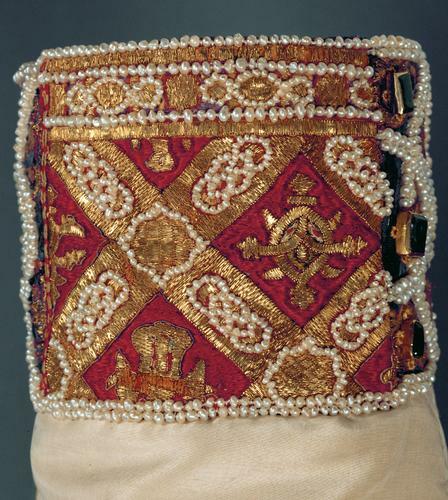 Mastery of work, wealth and beauty, and not inferior to the waist, the waist is on the Infanta. 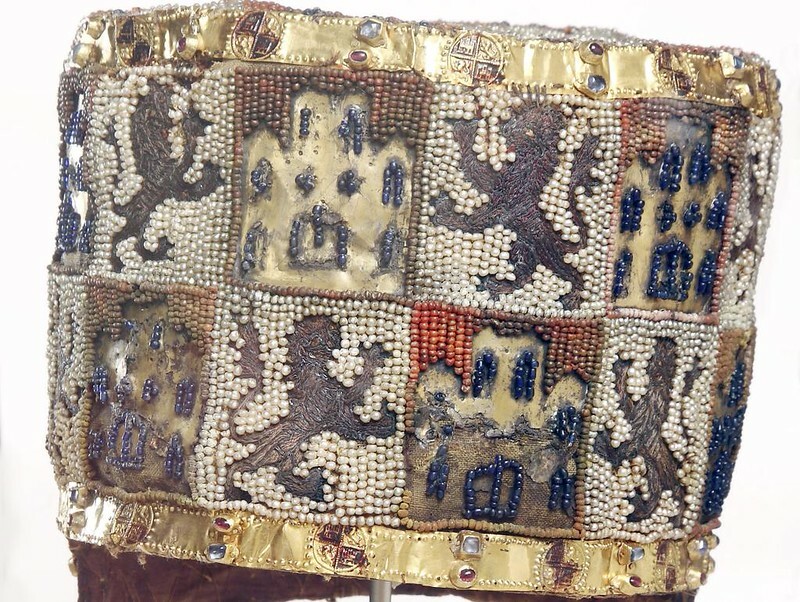 This belt, unlike other clothing, jewelry heraldic symbols of Castile and Leon, had the marks of the royal houses of England, France and Navarre; presumably on the buckle emblem of Champagne. 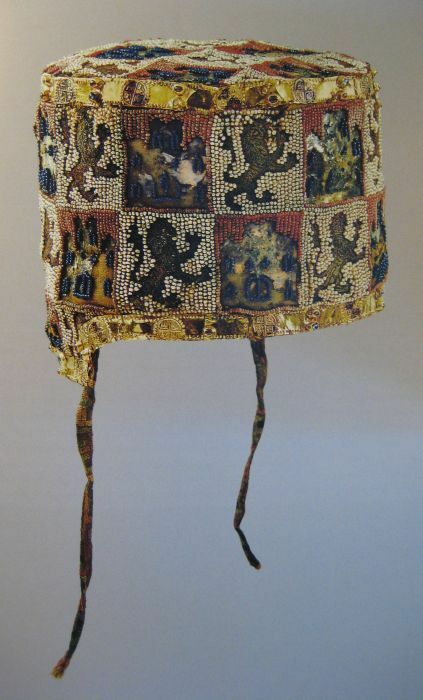 On the belt, there are also nine other heraldic symbols, not known in the thirteenth century Castile. 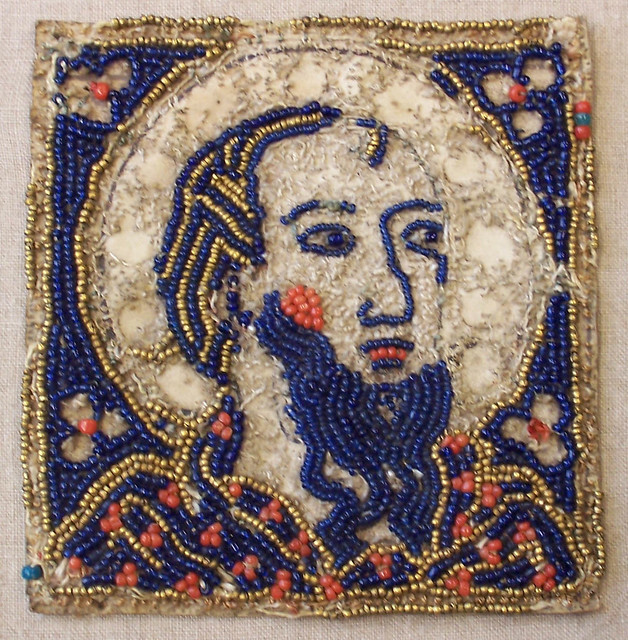 Where does this thing and whose work he did not know until now, but there is debate about the three versions of its origin: Spanish, French or English. 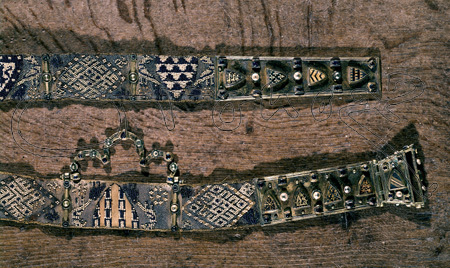 20 sections belt decorated with alternating patterns. 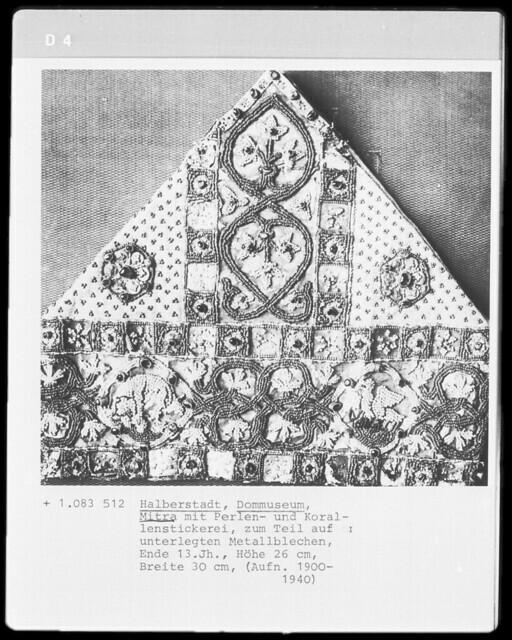 10 of them are filled with intricate geometrical ornament in diamond-shaped framework, none of the images are not repeated, although they are very similar – including on a blue and white color scheme. 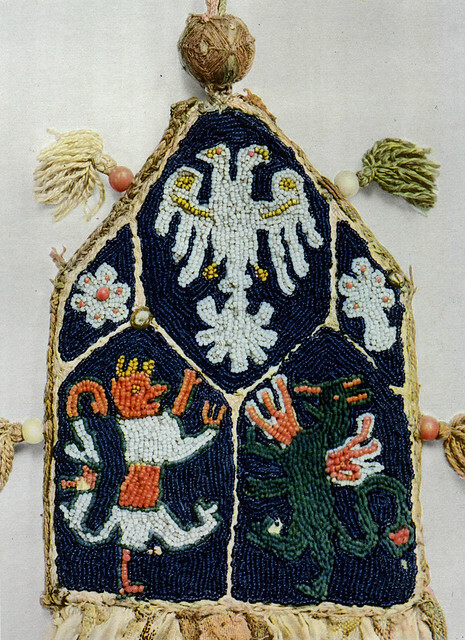 10 other sections filled constituents heraldic shields, some of which are repeated also on the buckle and the shank. Shields also made ​​in white and blue color, so it is unlikely that they reflect the actual color shown on them emblems. 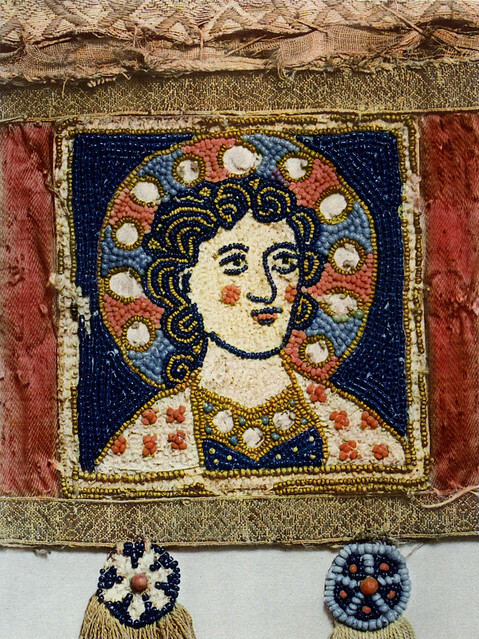 White and blue colors were not a couple inherent Heraldry Europe XIII century. 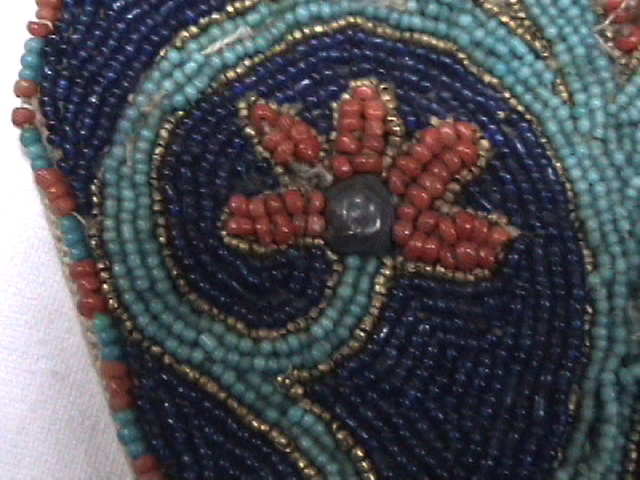 Shields keep embroidered with white beads birds sitting on divided into 8 segments wheels. 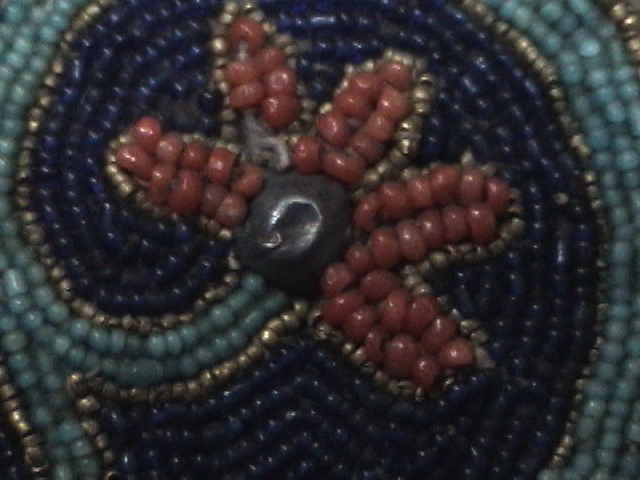 The remaining space between the wheel and shield busy little blue birds. 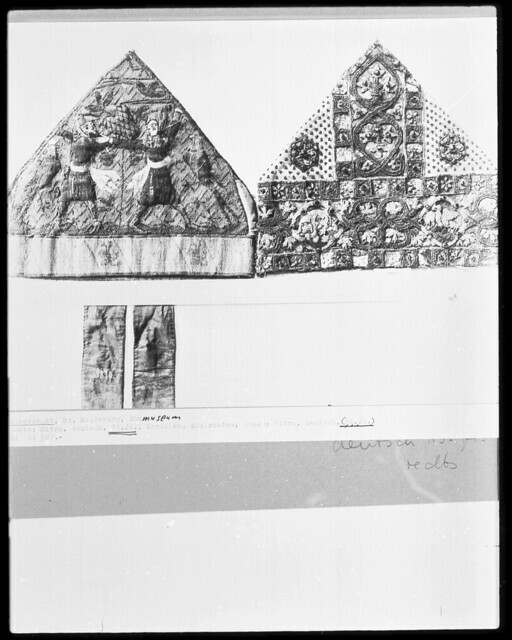 Attempts to identify the heraldic symbols of those boards still causing heated debate and has not been successful: no consensus on this issue has not been worked out. 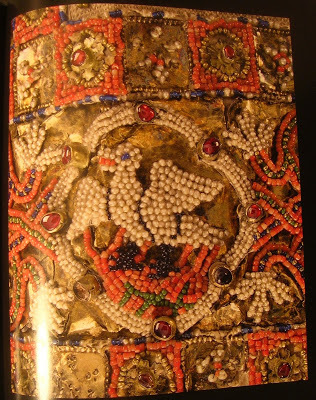 Double headed eagles are also more a later period German charge, not a early period spanish one. 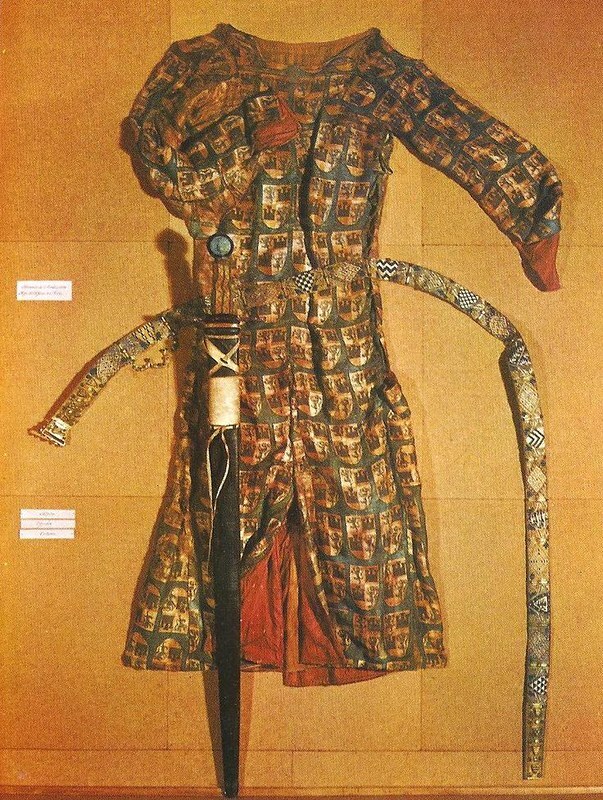 Especially since I also have the accompanying armourial surcote. 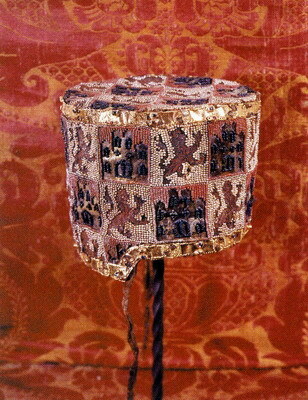 It is covered with the arms as well (not beaded so it was not included here), and they are the more typical 3 Tower-type castles on it. 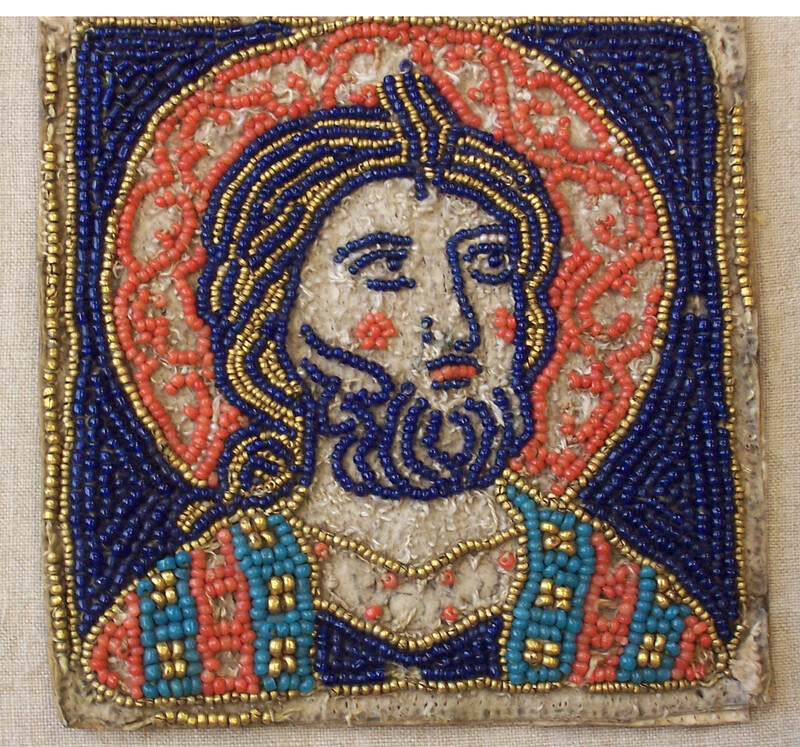 The author of the above quote must not have seen a good picture of the piece because her sketches are quite awful, I won’t use her drawings on this site as they are quite ugly and more confusing than anything else.